That is a pretty good example of where permaculture started, but it has grown into so much more over the last 40 years. The word itself came from “permanent agriculture,” because Bill and his student David Holmgren saw that the current system of agriculture was destroying the world around us, its goal was to obtain high yields without much thought to what the long term effects would be. They saw that the current system of agriculture was temporary, and would soon destroy the very land it was based upon as has happened many times throughout history. They sought to create a system of permanent agriculture, based upon natural patterns, that would continually regenerate itself in the same way that a forest ecosystem constantly creates its own soil, water, and resiliency. However, in the natural and the human world, nothing exists on its own, and Bill and David realized that our agricultural system had to be tied in and connected to all our other human systems, as well as the greater environment. They saw how all of our actions and systems, water, power, housing, transportation, entertainment, ect., are connected and dependent upon one another, and in order to create a truly permanent and sustainable human existence we had to design all of the aspects of our culture to work together. Thus, the meaning of permaculture expanded from permanent agriculture to permanent culture, and over the years permaculture practitioners have applied this system of design to all these different aspects of human existence. In my own journey studying and learning about permaculture, I have found that permaculture has grown over the years into more than a design system, though the original ethics, principles, and techniques have remained as the foundation. It has become a movement, a way of thinking, a world view, and a paradigm. When you start learning permaculture design, it changes the way you see the world, it changes your perception of events and people, it changes what you think is possible. Once you are armed with this information, you can set out into the world knowing that there is hope for a better world, that it is possible to work with nature in a way that helps both Humans and the rest of the natural world thrive, and you can start doing good work and facilitating truly effective change. There are now countless people out in the world doing just that. By sharing information and introducing people to the world of permaculture through oneheartfire.org, I hope to add to that wave of positive action that is transforming the world around us. I have changed the format of the site a bit. You can still find my old blog below, but most of my efforts are now focused towards my video series, which is reaching more and more people every day. I would like oneheartfire.org to be a place where people new to permaculture can come and be directed towards good information in whatever field they are interested in. To that end, I have created a Resources page which will point you towards many books, websites and other information sources that I have found valuable in my permaculture studies. I will be adding to this as I discover more good information. Of course, I am still working on my own projects, including my plot at the Ant Village in Western Montana. This year I will be continuing to work on the infrastructure of my homestead, while starting to bring to life my vision of the Permaculture Bike Park. It is bound to be an exciting project, so stay tuned to the videos to follow along. I am also starting to do more projects with my permaculture design busines Earth Care Design, starting with a suburban lot near Seattle. As I work on these projects, I will be sharing my experience so you can join me as continue the transition towards making a living through permaculture. I hope you enjoy the videos and are inspired to get past any fear, and make some changes towards a more rewarding lifestyle. Thank you for visiting oneheartfire.org, and thank you for joining me in building a better world through permaculture. The PDC is over and it’s time to get down to business in the Ant Village. Before getting to work on my own projects, I needed to do some bounty projects for Paul, to raise money for buying materials. There is always lots of work to do here at Wheaton labs, but sometimes the weather has other ideas. A little rain is always welcome though, and it gives us time to get to know each other better. Together, we are working to build a permaculture community, one day at a time. I’ve decided to record a podcast from time to time to share in more detail what is going on with my Ant Village homestead project. This is my first time recording a podcast, so it is a bit rough around the edges. In this podcast I talk a bit about my journey in learning permaculture so far, and what brought me to the decision to move to Montana and take a shot at the Ant Village Challenge. 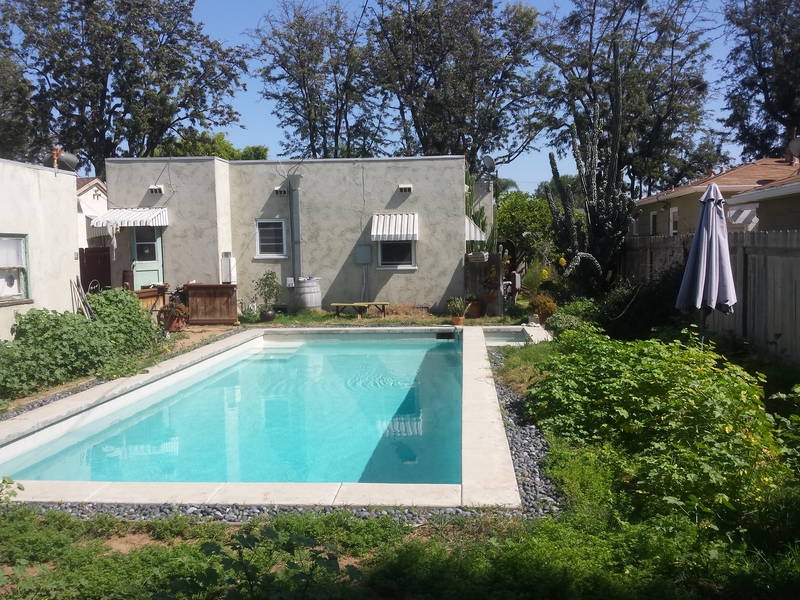 I also talk about wrapping up my yard conversion project in San Diego, some of the lessons I learned from the experience, and about a visit I made to my Permaculture Bike Park project in Orange County. Finally, I go over some of my strategies for the Ant Village project, and talk a bit about my feelings on animal systems. 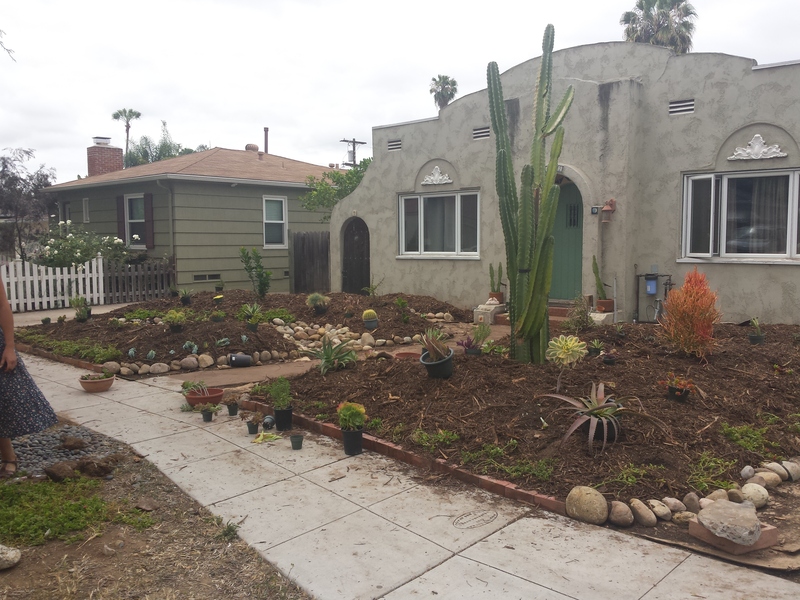 The yard conversion project in San Diego is finished for now, and everything is looking great! I can’t sit still for long, so it is time to start a new project, this time on an even bigger scale, and in a much different context. Check out my new video to see what it is all about. Another day of laying down concrete pavers. We are getting close to the end of the area that needs to be done, but we are also running out of concrete pieces large enough to use as pavers. It is a bit hard to believe considering the size of the concrete pile that was once in the front yard, but what is left is mostly rubble and dirt. 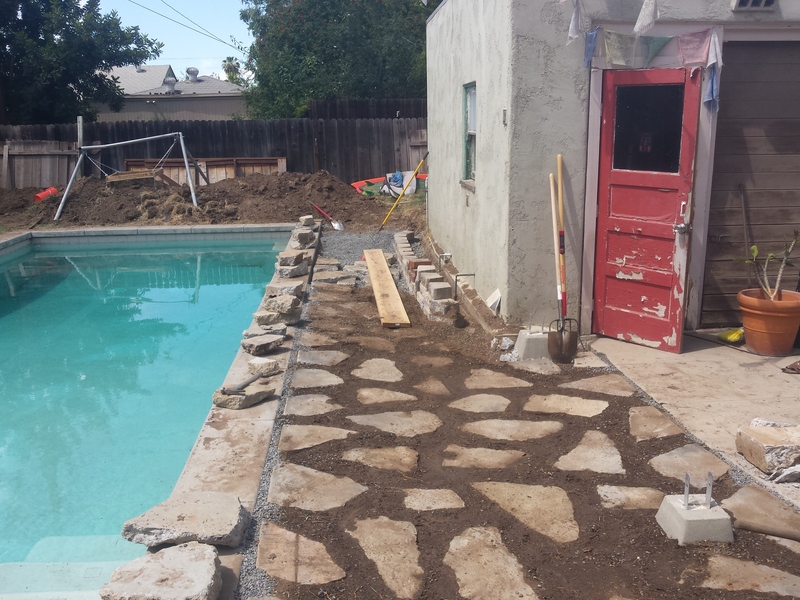 I was originally planning to do the fire pit area with urbanite pavers as well, but considering how long this is taking and how much work is involved, and after talking to Melissa, we have decided to just use decomposed granite for that area of the yard. Mellissa helped us for a while today, and her and Carol-Anne finished filling in the large planter with a 1 to 1 mix of compost and native soil. They Also screened some more compost/soil/gravel mix for in between the pavers. 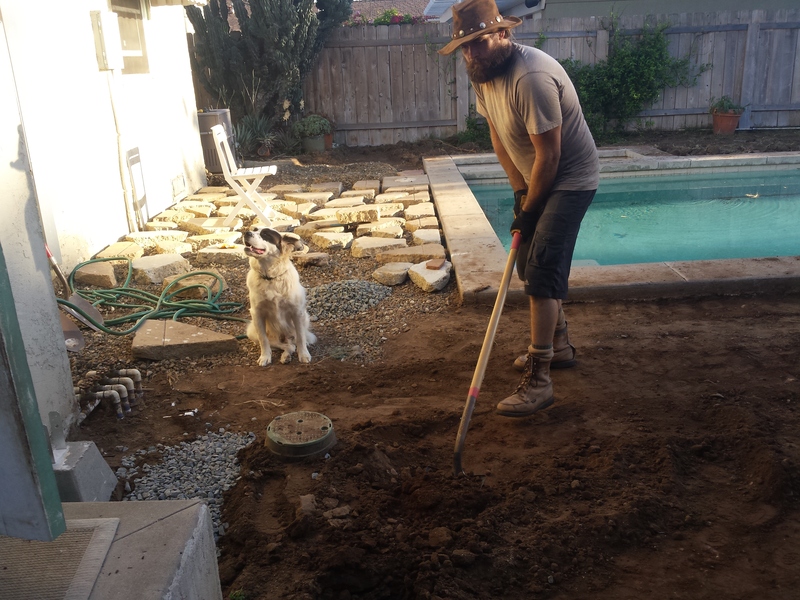 After running out of concrete for the pavers, I dug a trench from the infiltration basin on the north side of the pool towards the southwest corner where the avocado tree will be planted. In this ditch I laid a 3 inch pipe with a drain cap on the swale end. This will act as the overflow spillway for the basin along the north side of the pool. In case this drain gets plugged, I also filled in the ditch with pea gravel, so that water will be able to seep out of the basin as well. As a final safety measure in case both of these spillways get clogged or fail, there is an existing drain to the sewer that is located next to the garage near the lowest point of the patio slab. This drain will be raised to just below the level of the patio slab so that if heavy rain ever causes the basin to fill, and the main spillway gets clogged, the excess water will be able to escape down this drain before it starts flooding the patio, and potentially the garage. A short day. I dug out new trench from the southwest corner of the garage towards the back fence, and then out to the southwest corner of the yard. 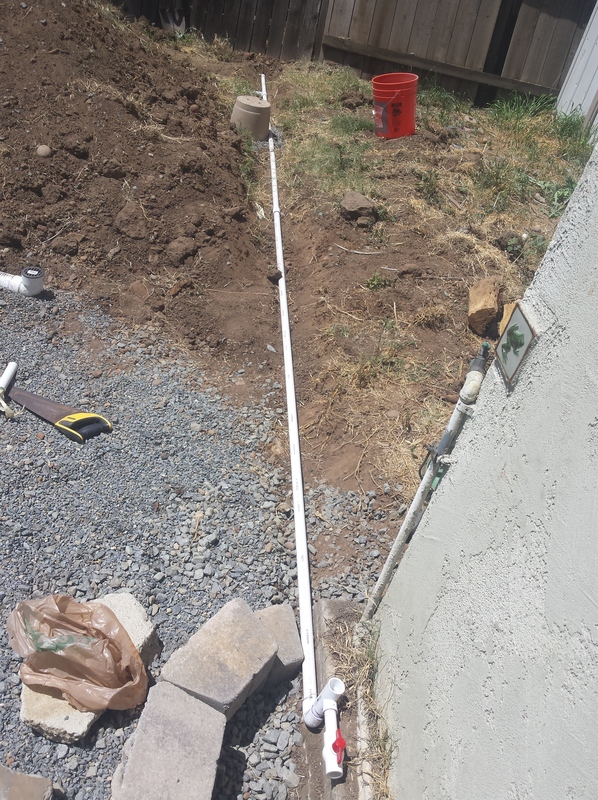 In this trench was placed a 1 inch pvc pipe for the laundry grey water distribution system. I recently purchased Art Ludwig’s book Creating an Oasis with Greywater, and he recommends using a 1 inch line for the main branch of the distribution system, in order to minimize the back pressure on the washing machine’s water pump. Off of this main 1 inch line, I installed 3/4 inch reducing elbows for the branches that will bring water to the mulch basins around the avocado tree and planters. We also screened a few more loads of fill dirt for in between the concrete pavers. The time has come to start work on the front yard portion of this project, and in order to do that we must remove the large pile of concrete rubble that is left there after picking out the slabs big enough to be used as pavers. We first moved and placed some quite large concrete chunks which I had set aside to be used on the west side of the pool. They will make a nice transition from the concrete pavers around the pool to the decomposed granite in the back of the yard. Next we loaded all of that rubble into the back of the truck, except for the smallest chunks of concrete and the dirt that came with it. These will simply be buried under the sheet mulch with the rest of the front yard.. Dump run day. We started off the day by taking the truck full of concrete to the nearby recycling facility. The fee for recycling the concrete turned out to be $111, a lot more than I had expected. I could have taken the concrete to the landfill for much cheaper, but concrete is such an energy intensive product to begin with that I would rather recycle it instead of just adding more to the landfill. Considering the fact that we got all of the concrete pavers in the back yard for free, instead of purchasing energy intensive and expensive manufactured pavers, I feel like $111 isn’t too bad. It is certainly more in line with the permaculture ethic of caring for the Earth. The recycling facility was interesting. There was just a huge warehouse space where we dumped our concrete onto a huge pile of random recyclable junk, along with all of the big recycling program garbage trucks. It must be all sorted out later. Once we returned from the recycling facility, we loaded up the big pile of tree trimmings and other green material that had grown in the front yard. I had looked into renting a wood chipper to chip all the green material and use it onsite, but the cost was going to be too much to justify. We had to go to the county green waste facility to get a load of compost anyway, so we brought the pile there where it will be turned into mulch and compost. We unloaded our “green waste” and then watched as a giant loader dumped a big pile of compost into the bed of the truck. It was much quicker and easier than shoveling it in by hand, like at the mushroom facility, and only cost $12 for the yard of compost. While we were out, we also checked into an add on craigslist for a person selling many different kinds of succulents for a very good price. He happened to be a fellow permaculture enthusiast and had a yard full of plants, including a ton of small succulent cuttings in 4 inch pots. After a dispute with his landlord, he was moving on short notice, and so he was happy to get rid of a lot of his plants. We got a wide variety of very interesting looking succulents, various cacti, a few agave plants, as well as some grape vines. He even let us take some larger succulent cuttings from the front yard, as his landlord was likely going to rip it all out anyway. It was an unfortunate situation for him, but we got to help him out with some extra cash, and he supplied us with most of the plants we will need for the front yard. Today we really got to work on the front yard. We first marked out the path of the future dry creek, and Carol-Anne got to work on digging it out. Meanwhile I started to dig out the existing sprinkler irrigation system, finding out where each station’s pipes ran, and fixing broken sections so that I mayre-use the underground distribution system for the future drip irrigation. I also dug a couple of tunnels beneath the front door walk way and drive way strip, and installed 3 inch pipes to allow water to flow through. This will allow the rainwater which is collected by the driveway strip to flow into the dry creek swale and across its entire length. The ground in the front yard proved to be very hard and compacted, so we gave the dry creek ditch a very thorough soaking, in hopes that it will be softer when we dig it to the final depth tomorrow. This morning, Carol-Anne continued to dig out the dry creek swale, being very careful in the area between the water meter and the hose bib where the main water line runs. I finished repairing and adjusting the irrigation system to convert the sprinkler heads to risers with adapters that will accept 1/2 inch drip irrigation tubing. I also replaced the old manual valves with an automatic valve manifold and 6 station timer. This will help ensure that all of the plants become well established in the first year, and in the future will make it easy to slowly adjust down the irrigation schedules until little to no irrigation is needed. Once this was done we verified the final level of the dry creek swale, and made sure that it is the same elevation across the bottom of the entire creek. Today we bought trees! After some Google and craigslist searching, we set off to a nursery in El Cajon to purchase the strawberry tree which will be planted in the front yard. The place was a huge wholesale nursery that was open to the public, so it was a bit overwhelming to find and look at the plants. I was going to try and pick up some native and drought tolerant shrubs for the front yard, but the prices seemed a bit high. We did pick up a strawberry tree, or Arbutus marina, as this was the only nearby nursery which had them in stock. We also picked up 4 flats of creeping thyme for in between the paving stones. After the big commercial nursery experience we headed over to a private residence to check out some fruit trees which were advertised on Craigslist. It was a much better experience. We met Paul, who is a rare fruit enthusiast and cultivator. His hilltop property was completely covered in fruit trees, including a mango tree which is apparently the largest in California. It was as much of a food forest as I have seen in Southern California, although it didn’t seem like Paul was coming at it from a permaculture perspective. I think he just really likes growing rare fruit trees. He orders trees from “the best fruit tree nursery in California” and then marks them up $15 from wholesale to sell on Craigslist. We got a much better deal on our fruit trees from him than we ever would have from a nursery, along with a lot of free advice. We also got to eat some of the delicious fruit from his trees. Into the truck went a Stewart avocado, a Sweet pomegranate, a pink guava, a Golden Nugget mandarin, and a mamey sapote in place of the mango tree Melissa wanted. Apparently new mango trees are hard to come by in California since a quarantine was placed on the Florida varieties that used to be shipped here. Sounds like a good opportunity to develop some locally adapted mango varieties. When we returned to the house we were eager to plant something, so we planted the Strawberry tree into its permanent home in the front yard. We also finished digging out a hole, and raised the pitaya cactus cuttings we had saved from the backyard into the hole. A stake was pounded in as well, and bicycle inner tubes were used to tie the cactus columns to the stake, holding them up until they can become rooted in place. By placing several large cuttings together in the same hole, we created the illusion of one large mature pitaya cactus. This will provide a nice mirror to the Strawberry tree on the opposite side of the yard, especially once the Strawberry tree catches up in size. Now that they front yard portion of this project has begun, the work is starting to bounce back and forth between the front and back yard, as materials need to be moved around and certain tasks must be done before others. One of the big tasks to be done in the back yard is to get rid of the large pile of soil that still remains after filling in all of the concrete pavers and the planters. So with the help of our friend Shelby, we moved a large portion of the soil into the front yard one wheelbarrow at a time. Carol-Anne and Shelby filled the wheel barrows, and I pushed them out to the front yard. It actually went pretty quick considering the amount of soil we moved. I dumped the wheelbarrow loads on both side of the dry creek swale, creating several mounds around the yard. Once all the soil was in place we raked it smooth and shaped the mounds, creating a very textured landscape across the once flat front yard. Moving forward on the front yard. We spent all day moving rocks! 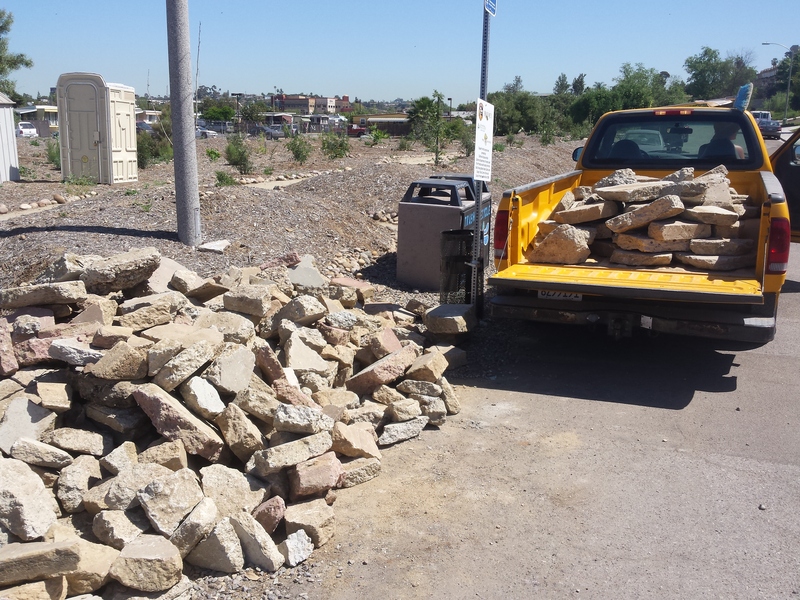 On one of our earlier trips around the area, we noticed a large pile of rounded stones that had been illegally dumped on the side of the road. Once again, what was a nuisance and waste product for one person, is a gold mine for us! We need a large amount of “river rock” to fill the dry creek swale, and to purchase it from the rock yard would be several hundred dollars. Of course, the rock yard would have loaded it into our truck on a nice pallet, or even delivered it to the house for a hefty fee, instead we had to individually throw melon sized boulders into the truck using out own two hands. We ended up loading and unloading three truck-full’s of rock today, and yes we are tired. We still need to go back and get more rock to create borders around the mounds and fill in some space on the side yard, but not today. Sheet mulching day. We began by laying down cardboard over the mounds we had created in the front yard, overlapping it with the cardboard we placed underneath the rocks in the dry creek swale. We used the hose to wet down the cardboard while we did this, which makes it a lot easier to form the shape of the ground, and keeps it in place until the compost goes down. Next we spread out the compost we had previously purchased from the green waste facility over the cardboard, in about a 3 inch layer. We ran out of compost after about 2/3 of the yard, so off I went back to the green waste facility for more. It sure is nice to have a machine load the compost into the truck for me. Of course, we still need more rocks, so on the way home I stopped by the rock pile and threw rocks on top of the compost in the truck, until my arms were tired and the truck looked pretty loaded down. I returned to the house and we finished layering the compost over the cardboard, after we removed all of the rocks from the truck and used them to create borders around the mounds. Earth Day! A perfect day to plant our fruit trees. 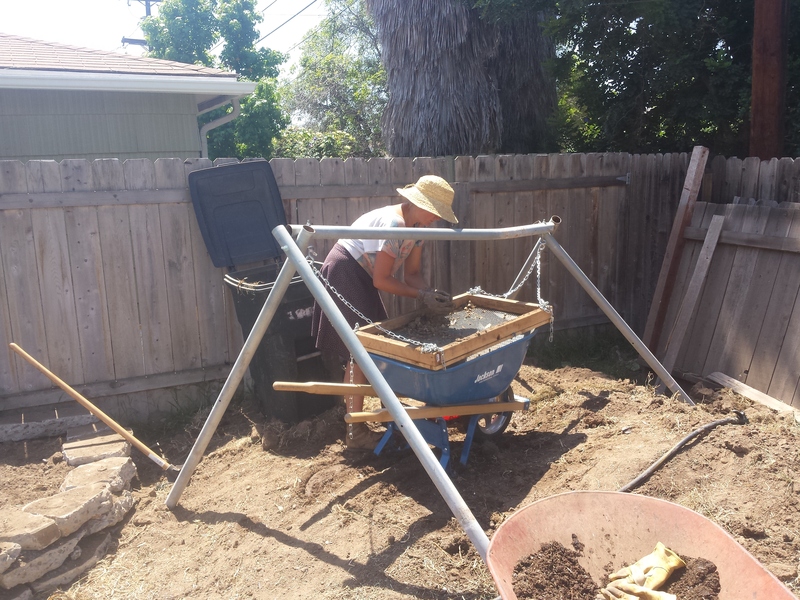 With Melissa’s help, we dug holes in the back yard concrete planter for the pomegranate and guava trees. Before placing the trees in the ground we thought about the wonderful gifts that trees provide, in the form of free food, cool shade, visual beauty, habitat for animals, and of course oxygen for us to breathe. It felt really good to be planting a tree in the ground knowing that it will live much longer than I will, all the while providing all these wonderful gifts to the residents of this home. I think the earth was thankful also, as the forecast is calling for rain showers tonight. The pure fresh water will be great for the newly planted trees. Once the trees were planted, I returned to the green waste facility and picked up 2 yards of rough wood chip mulch. Very rough in fact, it has whole pine cones in it! It will serve its purpose anyhow, holding moisture in the soil and preventing weeds from germinating. We spread this mulch out over the compost in the front yard, to a depth of about 4 inches. We also spread it in the back yard planters, with plenty left for around the remaining fruit trees. In the late afternoon, we got one more tree in the ground for Earth Day as we planted the avocado into its permanent home. When planting all of the trees we dug a very large square hole, about 3 times the size of the pots the trees came in. This will ensure that the trees have good drainage, and the square corners will be points where the roots can penetrate the more compacted sub-soil. For the avocado tree, we filled in most of the hole we dug out, and set in the tree so that the root ball sat above the level of the ground. Then we mounded soil up around it. Planting in a mound like this will help ensure that the root ball has good drainage, and wont suffer from root rot. More planting, this is the fun part. We started out the day by arranging the succulents we had previously purchased around the front yard, moving the pots around until we felt we had a good arrangement. It is a bit tough when planting from small pots, as you have to imagine what the plants will look like when they are full grown. We have plenty of succulents to work with so we opted to go with a tighter spacing, meaning that when the plants are fully grown they will be overlapping slightly. This should help with weeds in the long term, as the plants will block out much of the light from the soil surface. To help stabilize some of the steeper borders of the mounds, along the sidewalk, driveway, and dry creek banks, we transplanted some of the “ice plant” succulents that are well established in the sidewalk strip. We needed to remove some of them anyway, so we are stacking functions! When we had placed all of the succulents to our satisfaction, we headed off to City Farmer’s Nursery in City Heights. This is a great family owned nursery that carries a lot of organic fruits and vegetables, and also has a coffee shop and grill attached. They also have a good selection of native plants, as well as non-native drought tolerant and pollinator friendly plants. We picked up a few of these to fill out the front yard and create some variety from the succulents. For the back yard concrete planter we picked out a Lion’s Tail, Purple Salvia, and Pride of Madera to fill out the space between the fruit trees, as well as some culinary and medicinal herbs for the rest of the planter and the side yard. This nursery carries a lot of different fruiting plants, so we also picked up a passion fruit vine and a male/female pair of kiwi vines for the side of the garage. They also carry bulk seeds, so I got a few ounces of white clover seed to fill in around the southwest corner of the yard, and any other spaces that end up as bare dirt. White clover is a perennial nitrogen fixer, so hopefully it will grow vigorously, suppressing the old grass and weeds that are sure to sprout up on their own. For beneath the pomegranate and guava trees we also got some comfrey plants and strawberries. I am attempting to provide some sort of a guild for the trees, a group of plants that benefit each other and the tree they grow with. I can’t seem to find much information about specific plants for specific trees, so I am just trying some out that seem likely to work. At any rate, I feel like plants have evolved to grow right next to one another, as you see everywhere in nature, and the idea that plants will compete for nutrients runs contrary to much of what I have seen, heard, and read about the natural world. We ended up getting all of the plants that we need to finish the project at this one nursery, along with a good cup of coffee. 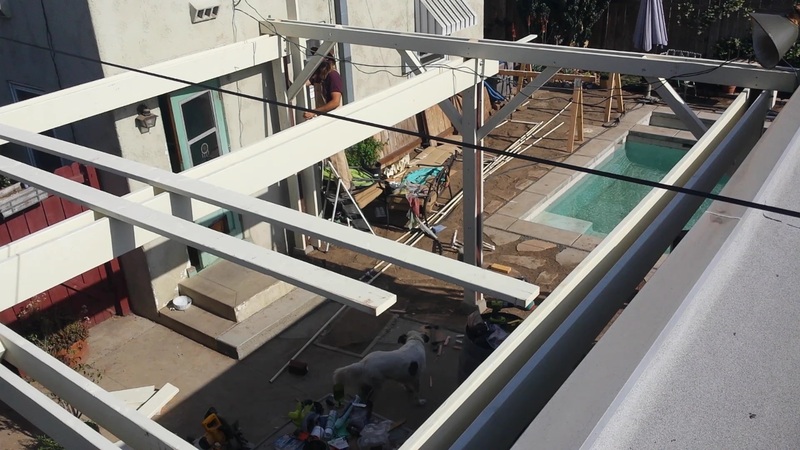 At this point, we’ve also spent nearly all of the budgeted money for this project, and there is still the pergola to be built as well as may more hours of work. It is looking like we will be well over-budget when it is all finished. Lots of progress today, finishing up small tasks around the back yard and planting out the front yard. In the morning I finished laying out the last of the concrete pavers in the back yard, and I am so grateful this task is finished. I don’t think I will choose to design this many pavers into any of my future designs. In this context, with the pool and the dogs, it does seem appropriate, but hopefully in the future I will find a more creative, and easier, solution. One challenge with using the urbanite like this is that you end up using the biggest pieces early on, and so now at the back of the yard I am having to lay down a lot of smaller pieces, creating a less consistent surface. In hindsight, I should have set aside a few large and medium chunks to be used at the end, forcing myself to use more smaller pieces in the beginning. Next I dug a hole for the mamey sapote tree against the west fence and close to the metal shed. This part of the yard will be very hot as it has no shade and the decomposed granite on the ground will reflect a lot of heat, and so will the white metal shed. An area like this is called a sun trap, or heat sink and should be a good microclimate for a tropical tree like the mamey sapote. I dug down about a foot and the soil got very hard and full of stones, so I decided to fill the hole with water and conduct a drainage test. It took the water about 45 minutes to soak into the subsoil, so I will dig the hole deeper to hopefully provide better drainage for the Mamey sapote. 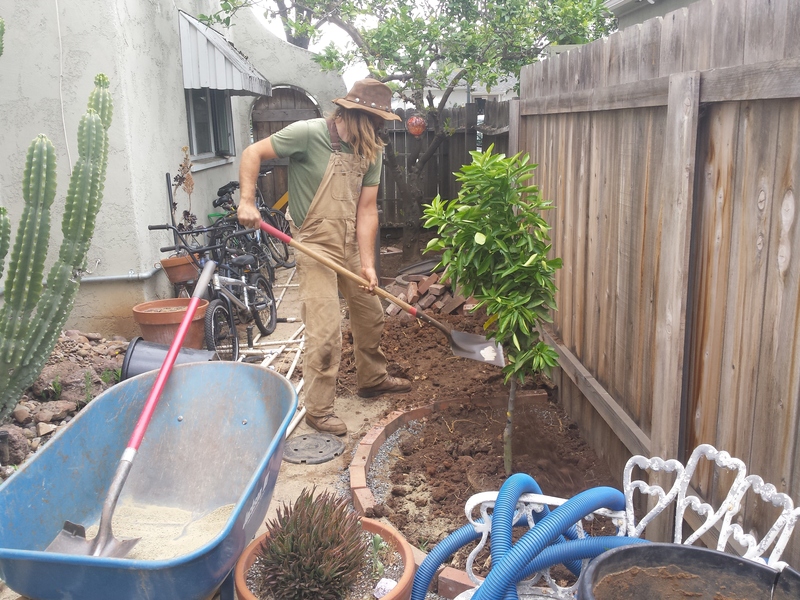 In the side yard I dug a hole for the mandarin tree and also ran a drainage test. It drained in less than half an hour and should be fine. I also exposed the drain pipe that was previously laid between the north side infiltration basin and the southwest basin, as an overflow for the north side. I added another length of pipe to extend the drain to the southwest basin, and filled in around and above the whole drain pipe with more gravel. This is another back up overflow incase the drain pipe gets clogged up, water will seep through the gravel and into the lower basin. On top of the gravel I put down cardboard as a silt barrier, and then filled in dirt back to the final level. Finishing up another small task, I created a trellis across the south wall of the garage using masonry screws with bailing wire stretched between them. We also did this along the south fence for the existing jasmine plant, so it may be trained along the fence. In the planter against the garage wall we planted the kiwi and passion fruit vines. They should both like the heat in this spot, as it is directly south facing and the sun will reflect off the pool as well. The vines should cover the whole wall eventually, shading the garage a bit and keeping it cooler during the summer. Meanwhile, Carol-Anne planted out the entire front yard with the succulents and drought tolerant shrubs. For 4 inch and smaller pots she just planted into the mulch and compost layer. For larger pots she cut a hole in the cardboard layer so the root ball could be sunk deep enough. It has been raining off and on all day, with more to come. A perfect start for these plants. The front yard looks incredible now that everything is planted, there is so much color everywhere. One nice thing about working on the front yard is that neighbors are always walking by and complementing on how nice the yard is starting to look. It makes the work a bit more fun, and I get a chance to tell them about permaculture. A short day today, I knocked out a couple small tasks. The first was repairing the fence around the old lemon tree. The crosspieces had rotted away and some of the slats were falling off, to the dismay of the neighbors. I sandwiched new 2x4s beneath the old ones and nailed the slats to the new crosspiece. Next we planted the Golden Nugget mandarin into its planter in the side yard. It is small now, but in the future it should grow to about the same size as the lemon tree, providing more shade to the south side of the house as well as incredibly delicious fruit. I also finished digging out the hole for the mamey sapote tree and we planted that in the ground. We had a lot of trouble getting the root ball out of its pot, eventually having to cut the pot into pieces. The root ball broke apart, leaving the three small trunks of the mamey sapote looking like bare root trees. It is likely to be quite a shock to the tree, I hope it will recover. Back to the back yard. Today we finished leveling out the dirt for the fire pit area. This means no more digging, yay! We shaped the ground in the raised fire pit area and around the sheds to all slope towards the mulch basin for the mamey sapote tree, so that when it rains, the water will go to the tree. Once that was done I installed the automatic valves for the back yard irrigation. One will go to the concrete planter, one will be a hose connection for a temporary sprinkler system to help germinate the creeping thyme seeds, and one is connected to the future grey water distribution system and will water the avocado, mamey sapote, and garage wall planters. When talking to the fruit tree nurseries, I found out that it is best to let trees become well established before irrigating them with grey water. So we will wait a couple years before installing the laundry to landscape system. Instead, I hooked up a hose bib on the southwest corner of the garage to an automatic timer that feeds directly into the 1″ pvc distribution system I installed for the grey water. On the branches I will install drip line adapters to provide water to the trees, and these can be converted later on to work with the grey water. Next, we planted out the concrete planter with all of the lovely herbs and pollinator friendly bushed that we purchased from City Farmer’s. The planter looks really nice all planted out and mulched, with lots of color. It will be good to see it once the plants grow out and fill in the empty spaces, there should be lots of nice color and texture. Finally, we installed a drip irrigation system in the concrete planter, with drip emitters located next to each plant, and I set the timer to water twice a day to help the plants get established over the next few days. 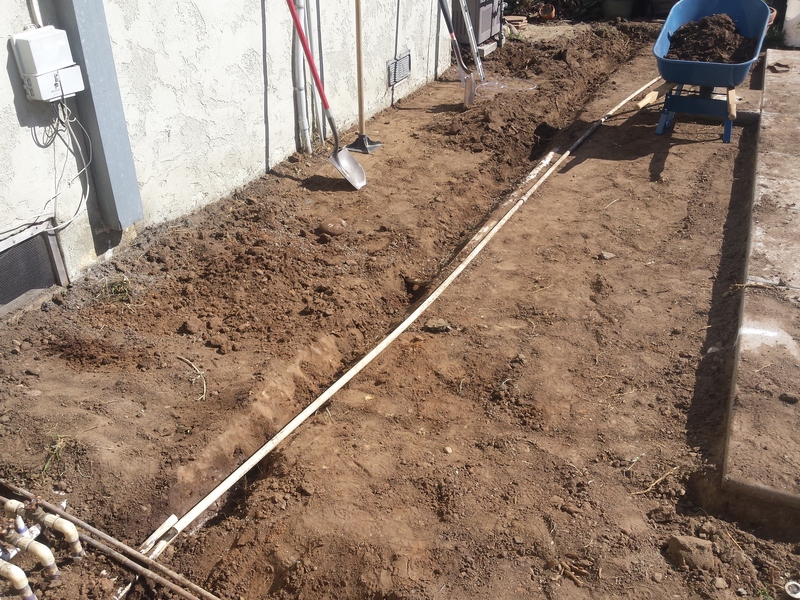 We also started to install the drip irrigation system for the front yard. Time to finish the fire pit area, the last section of the yard to be done! In the morning I picked up a yard of 3/8″ pea gravel, while Carol-Anne laid down a layer of cardboard over the entire fire pit and shed areas. The cardboard will prevent grass and weed from growing back though the decomposed granite, and the gravel will provide a nice base for the DG, keeping it from sliding around on the cardboard. We spread out the gravel and then I marked out a circle for the fire pit area, using a stake and a length of string tied to the marking spray paint can. In this circle we laid down a medicine wheel pattern, aligned to the compass rose, utilizing a large pile of old bricks that was once in the side yard. I like the fact that a lot of the materials used in this project have come from on site, and what was once an eyesore is now part of a beautiful design. Once the medicine wheel was complete, I went to pick 2 yards of decomposed granite from the rock yard, enough to finish the front yard and the fire pit area. Meanwhile, Carol-Anne continued to install the drip irrigation system in the front yard. When I returned, we shuttled many wheel barrow loads of DG into the back yard and spread it out over the fire pit and shed area. I then rented a “lawn roller,” which is basically a barrel with handlebars that you can fill with water for weight. Carol-Anne watered down the decomposed granite while I went over it with the roller to pack it down and smooth it out. Special attention was paid to the slopes and edge of the raised area, to make sure that they were well packed down and stable. We left the inside of the medicine wheel pattern empty, and plan to fill it with the blue/black river pebbles that we removed from around the pool, in the first days of the project. Today we nearly finished off the front yard. While Carol-Anne was washing the blue/black river pebbles and shuttling them to the medicine wheel in the back yard, I spread decomposed granite over the borders and paths in the front yard. These areas were all too narrow for the roller, so I just used an 8 inch tamper to compact the wet DG. The DG around the borders gives the front yard a very satisfying finished look. Lots of people are commenting on how nice it looks as they walk by, along with comments about how much work we have been doing. This is very true, and we are both getting very worn out from the long days of heavy work, but the project is nearing completion and I would like to get it done soon. Carol-Anne continued to wash and move the pebbles to the back yard, a very time consuming task, and I began to dig out the drain for the driveway strip. The ground here is very dry and compacted from being driven over for years, so this was not easy work either. I used water to hopefully soften up the dirt, while also helping to confirm that my drain was running down hill. When Carol-Anne was finished, we started cleaning up the side yard, moving out all of the materials and random stuff we have been storing there while we worked on the rest of the yard. Today we continued to finish off the side yard. We planted succulent cuttings to fill out some of the empty spaces, and washed a lot of rocks that we had collected from our soil sifting operation during the concrete pavers project. We used the rocks as mulch to fill in around the succulents and cacti, creating a desert look. 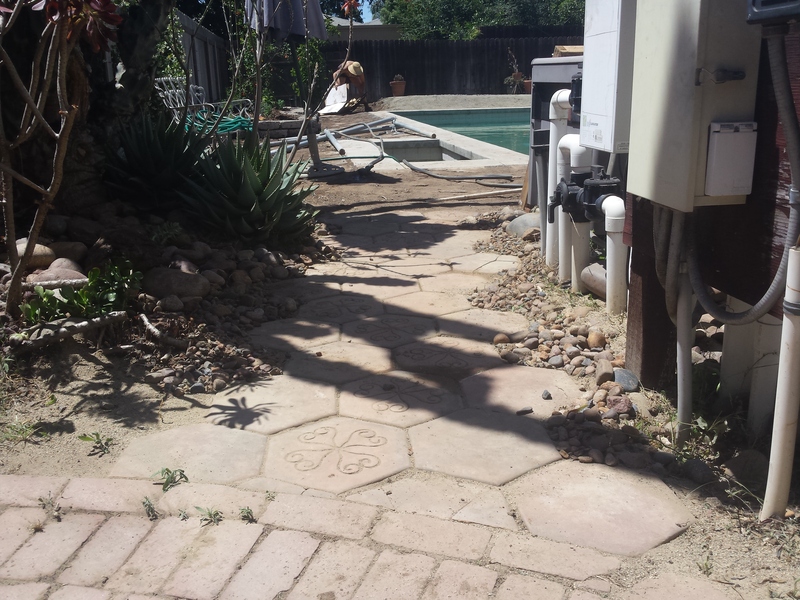 I used the gravel sized rocks to line the short section of path next to the pool filter. The side yard is looking very good. Next we used the rest of the sand we had left over from laying down the tile path on the side yard, to fill in the cracks between the bricks in the medicine wheel design. With decomposed granite on one side, pebbles on the other side, and sand filling all the cracks, the bricks should stay well in place. Time to start of the pergola, the last major piece of this project. After comparing prices on the lumber, I picked up most of it at Lowes, and the posts and long 2″x6″x20′ pieces at Home Depot. 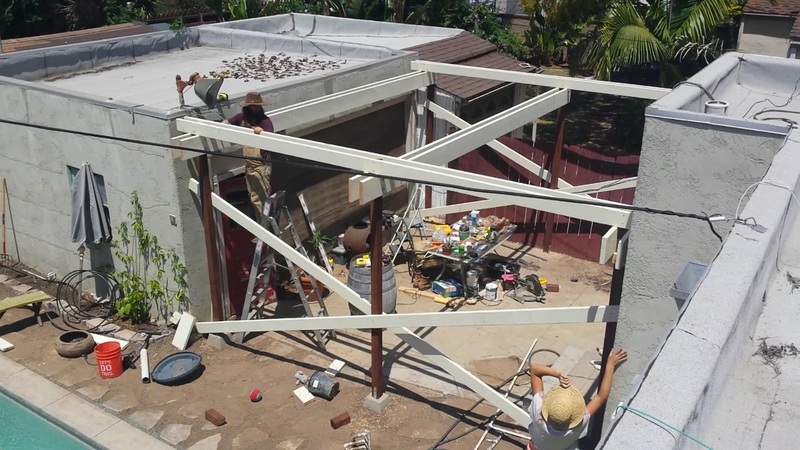 It is going to be quite a big pergola, about 18’x18′, and the lumber alone cost around $600. This project is definitely going to be well over budget, but I have talked to Melissa about it and she is very please with the way the yard has turned out and wasn’t too surprised about being over budget. The pergola is something she really wants so we are going to include it. 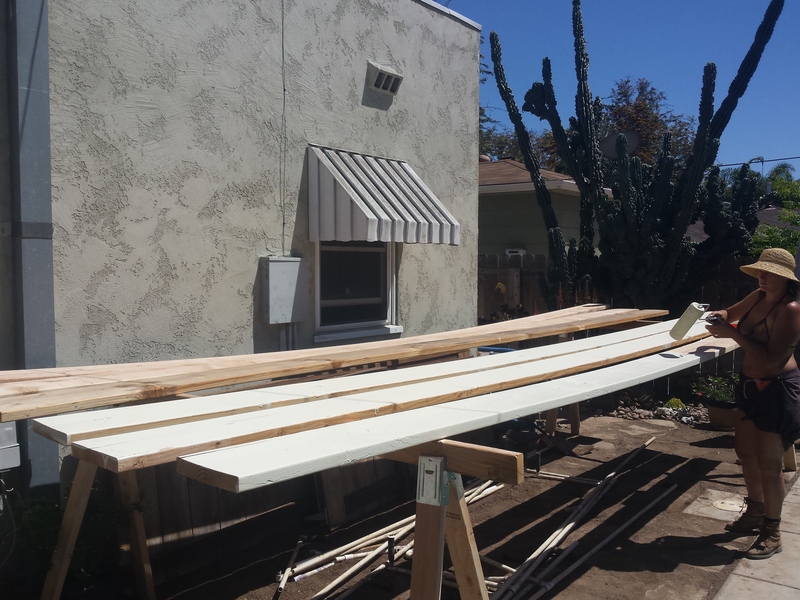 When I returned with the lumber, Carol-Anne began to paint it with an exterior wood sealing paint, in an off white color. Today I started construction on the pergola. 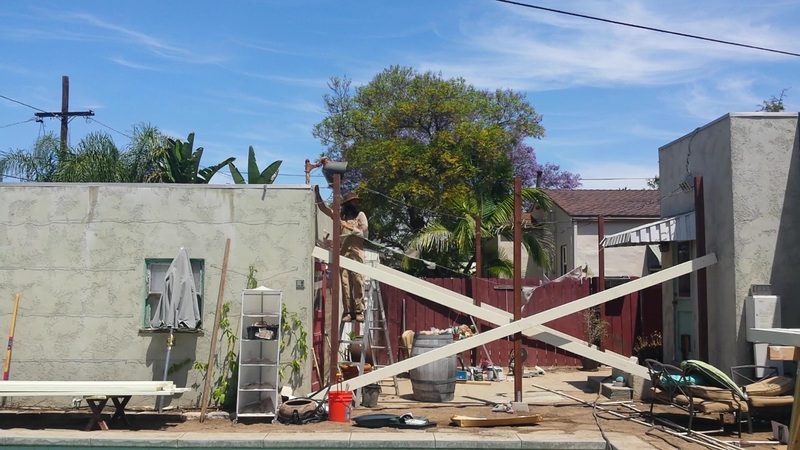 First, I set the posts into the brackets and footings I had previously installed, and braced them in position with some of the 2″x6″x20’s that will go on top of the pergola later. Next, I began to install the main beams that will support the rafters. I wanted to leave the entire patio area open, without any posts in the middle, to ensure that the garage door could be opened and a car could still drive into it if ever needed. This meant that the longest spans had to be 18 feet between the posts. I was a bit worried about this until I notice that the roof on the garage, which was built in 1927, is supported across an 18 foot span by single 4″x6″ piece of lumber. It has survived for nearly a century without too much sagging, so I was confident that two 2″x10″x20′ beams sandwiched around the posts and connected with two 3/4″ bolts would be sufficient to support the structure and the weight of the vines that will grow over it. These will be braced by 4x4s at 45 degree angles from the posts as well, reducing the effective span to about 14 feet. If the structure does start to sag in the future, there will be spaces between the 2×10 beams and 2×6 rafters where more posts may be installed. These big 2″x10″x20′ beams were a bit difficult to raise into position with only Carol-Anne and I to lift them, but we managed by pre drilling one side of the beams and attaching them to a post, then raising the other side up, ensuring that it was level, and attaching it to the post with screws while the bolt holes were drilled and the bolts installed. I got the three sets of sandwiched beams installed this way, as well as the first set of doubled up 2″x6″x20′ rafters before the sun went down. More pergola raising. Today I finished installing the 2″x6″ rafters on top of the beams. There are 12 of them overall, set in twos at about 4 foot intervals. They were held in place with structural rafter ties, as well as screwed into the posts. Before installing the rafters, I trimmed the top of the posts off at an angle to ensure that water will not pool on top of the posts and work its way inside. The posts are pressure treated, but it is always a good idea to shed water. On top of these will go 4x4s spaced every two feet to finish off the top. In between these rafters and bolted to the posts, I installed 4″x4″x4′ braces to help support the structure laterally. Once these were up the structure became much more stiff, and I felt comfortable walking on top. I also installed 2×6 boards on each side of the 4×4 posts, to stiffen them up, support the beams from beneath, and add a bit of visual width to the posts. While I was working on the pergola, Carol-Anne worked on finishing off the front yard by cleaning up the green strip between the sidewalk and the street. She planted a few of the succulents we had left, and laid down the rest of the decomposed granite over the whole area. This should be a very low maintenance part of the yard. The pergola continued. Today I finished erecting the structure of the pergola while Carol-Anne finished off the front yard green strip, along with our friend Shelby who came to help out. All that was left was to lift the 4×4 boards onto the top of the rafters and screw them into place at 2 foot intervals. It took a long time, however, as each board was pre drilled and screwed in from underneath, with two screws into each rafter. I wanted to make sure they were well attached so they would add stability to the structure, and I chose to screw them on from underneath so there would be no screw holes on top for water to settle into. I used 8 foot boards for the back of the pergola, and 10 foot boards for the front so they would hang over the front of the rafters, creating a bit of an eave. Once the structure was finished, Carol-Anne and Shelby filled all of the screw holes with wood filler to prevent water from getting inside the wood, and to make it look better. They had to go back later and sand every one, not a quick task. So close to finishing this project! The pergola is finished and really has changed the entire look and feel of the yard for the better. The patio, which was once just a hot concrete slab, is now a nice cool place to sit, and the pergola above somehow makes it feel bigger. Carol-Anne and Shelby spent the day doing touch up painting on the pergola, while I used the old wall and gate that once separated the patio and the pool area to create a new set of gates between the posts of the pergola. One of the 5 dogs, Ollie, has been blind since birth and has a history of falling into the pool, including once while Carol-Anne and I were there, thankfully. The wall and gate were originally installed to keep him out of the pool area, so it was important to put a barrier back up for his safety, as well as the safety of any children that might be at the home. The flow of the yard was very much improved when we removed the wall previously, so I wanted to make it so the new gates could be removed easily and set aside for pool parties or entertaining. I cut the old wall into appropriate lengths and installed lift off hinges on to the posts. I installed L-spikes on the bottoms of two of the gates to hold them in place, and latches where the gates meet, so that the smaller gates in the center of the pergola could be easily opened and swung open. Finishing touches on the back yard. Carol-Anne and Shelby continued with the long process of touch up painting on the pergola. While they were working on that, I finished digging out the drain in the driveway strip. The driveway slopes in the opposite direction from where I needed the water to flow, so the drainage ditch had to be well below the level of the drain pipe once it reached the point next to the dry creek swale. This actually turned out to be a good thing, as any silt that is carried by the water will settle in this low part of the drain, while clean water will overflow into the drain pipe. If the ditch doesn’t fill up to the level of the drain, the water will still slowly seep into the dry creek swale through the gravel that surrounds the drain pipe beneath the driveway slab. The whole drainage ditch will be filled with rough gravel later. r flowed nice and slowly down the basin, which is a good sign that the basin is level. While the basin is level along the whole length of the concrete planter, the water didn’t want to spread all the way to the far end of the basin, instead it flows into the planter from the end closest to the house. It seems the basin we dug out beneath the pavers and planter is a little lower beneath the concrete planter, so the water is moving beneath it instead of around the edge of the planter. I don’t think this will be an issue, however, as the water should spread beneath the ground just as well as on top, and the trees roots will find it wherever it is. There’s not much we can do about it now anyway. Next, I built the outdoor shower. This was done in a very simple way by just running copper pipes and attaching a shower head on the back wall of the house. After looking at different household mixing valves, I decided to just use regular brass stop valves for the hot and cold controls, and tee them together before the shower head. There was a convenient access point to the hot an cold water lines where they stick out of the house before going underground to provide water to the garage. I was able to tap into these by cutting a short section out of the pipes and then installing a tee into the gap using copper couplings without stops. You can slide these couplings up the original pipe, insert the new section with the tee, and then slide the couplings back over the new joint. It has been a while since I have soldered copper pipe, so it was fun to put this little puzzle together. Once the shower was all put together I tested it out. It worked fine, with good hot water and no leaks, but I realized that it would not work to have soil around the shower. The soil quickly got muddy and started washing away, so it will have to be dug out in this area and replaced with gravel. Finally, I began to set up the temporary sprinkler system that will help the creeping thyme seeds germinate and get established between the pavers. Previously, I set up an automatic valve with a hose attachment so that this system could be set to go on three times a day to keep the soil moist while the seeds germinate. The hose connects the valve with the sprinkler system, which is built from the old irrigation network which we dug out of the yard early on in the project. Once I had it all hooked up and tested the system, I discovered that there was not enough flow and pressure in the lines for the sprinklers to actually spray. There are too many sprinkler heads in the system for them all to run at once, so I split the system into two sections and tried connecting one of them to the automatic valve which was previously connected to the grey water lines watering the avocado, mamey sapote, and garage wall planter. I don’t have any more zones in the irrigation timer to add another automatic valve, so I had to use this one for the time being. I figure the garage wall planter and avocado tree will be watered by over-spray from the sprinkler system, and the mamey sapote irrigation has been turned off anyway as its soil needs to dry out. I tested this new set up, but discovered that it did not work either, as this last automatic valve is connected to a hose bib valve which restricts the flow too much for the sprinklers to operate. It is very frustrating, I need to figure out how to get this sprinkler system to operate or else we wont be able to get the creeping thyme established between the pavers. However, it is late and I am tired, so I will have to leave it for another day. We have now been working on this project for 22 days straight, and it is certainly time for a break. Carol-Anne and I are both very tired, and did not expect this project to take so long. At this point we have been working to just get it finished so we can move on to other things, but working at this pace is taking a toll, physically and emotionally. We are going to drive up to Orange county to take a much needed break over the weekend, and return next week to finish up the last small tasks. A much longer break than expected, and a hard lesson. I ended up in the hospital on May 8th, and had to take a couple weeks of rest to recover. 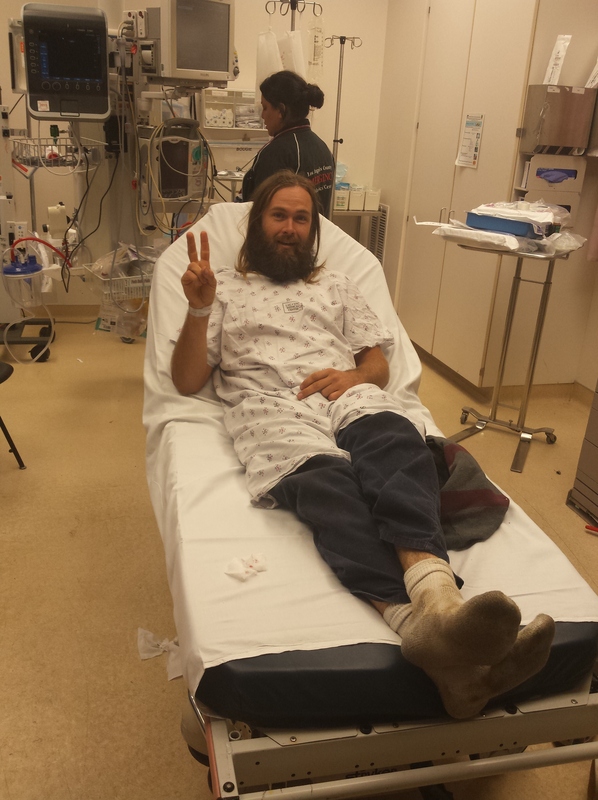 I was riding BMX with my friend Travis in Los Angeles, and had a crash that resulted in a bad concussion, even though I was wearing a full face helmet. I was knocked out for a minute, and incoherent for a few hours. The last thing I remember before waking up in the hospital was jumping my bike and being very tired. When I woke up, it wasn’t all at once, but in short moments over a few hours. From the people around me I learned that I was looping over and over, repeating the same things and asking the same questions. It was a very scary experience, to say the least, and after a couple weeks of reflection I have come to see it as life telling me to slow down, rather forcing me to slow down. I was trying to fit too many things into my life, piling too much on to my plate, pushing myself to do something I enjoy because I have spent so much energy working on something I was no longer enjoying. It is reflected in the project as well. I wanted to include all of my ideas into the design instead of starting with something simple, and have ended up far over budget for time, money, and energy. In hindsight, it would have been better to start small or to do the project in stages, and absolutely necessary to schedule days off for Carol-Anne and I. I have a designer’s mind and a builder’s personality, so I tend to get laser focused on certain things, putting all of my energy into my project to the detriment of other areas of my life and self. I need to learn how to balance my work and my passions with time for taking care of myself and my relations. Of course, this is something I have been aware of for some time, but when you don’t listen to the subtle lessons life hands you a hard lesson, or a good knock on the head. So, after taking some much needed time off to do nothing, Carol-Anne and I returned to Melissa’s to finish off the yard conversion project. I started by going to the rock yard to pick up a yard of 3/4″ crushed rock, while Carol-Anne dug out the soil from between the pavers in the shower area. 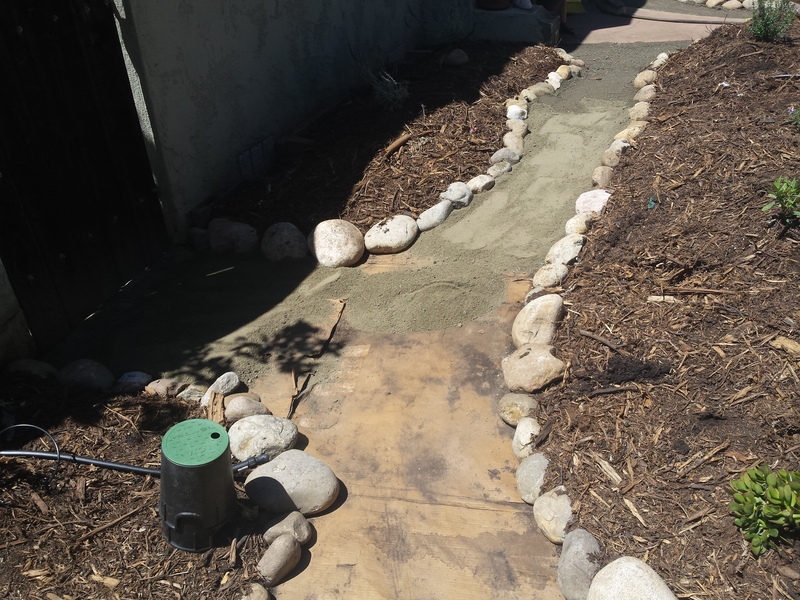 When I returned, we filled the spaces most of the way with the 3/4″ gravel and then topped it off with some of the blue/black river rock from the medicine wheel fire pit area. This new shower drain functions very well, the water flows right through the gravel to below the pavers, where it will flow through the bottom layer of gravel towards the north side infiltration basin. 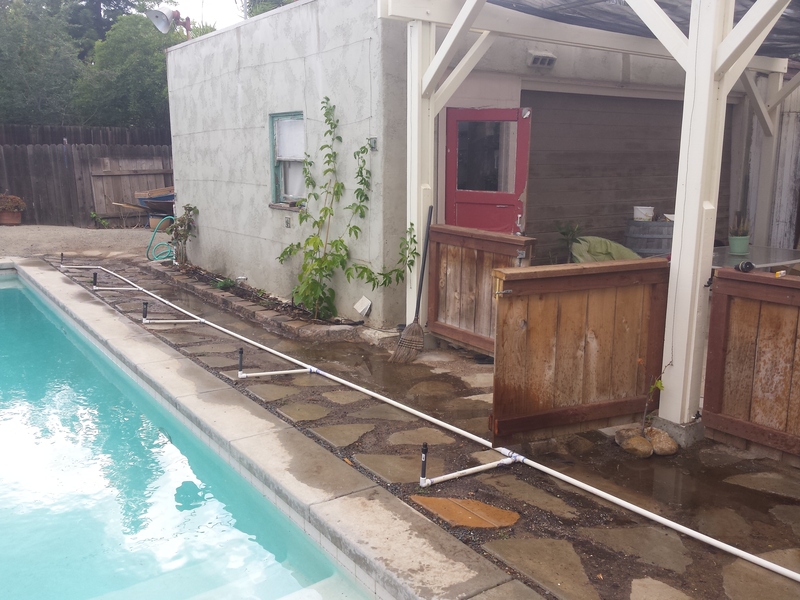 When we were digging the basin, I tried to slope it so that water from the shower would flow toward the planters where grape vines have been planted to grow over the pergola. Hopefully, frequent use of this shower will eliminate the need to irrigate these vines. The river rock in the fire pit area was not a very solid surface, as the rocks would move around as you step on them and the feet of chairs sank right in. To fix this, we temporarily removed the river rock and put the rest of our decomposed granite in a layer inside the medicine wheel design. We then replaced the river rock in a thinner layer that sinks into the layer of DG, holding it in place. When it was done the surface of the rock was much more stable and chairs could be placed on top without sinking in, it also provided us with extra river rock for the shower drain. Then we used the rest of the 3/4″ gravel to fill in the driveway strip drainage ditch up to the level of the driveway. This was made easier by the fact that we could just back the truck up the driveway and push gravel out of the bed into the ditch, no wheel barrow required. Once it was all filled in, you would never know that there was a drain under there, it just looks like an ordinary driveway with a gravel strip. The final day! Carol-Anne got to work doing a final clean up of the yard, and organizing our belongings so we can move out of the garage. I set out to figure out how to get the sprinkler system to work effectively. I abandoned the idea of using the garage wall/avocado tree station since it doesn’t have enough flow. I also extended the drip system on this station to irrigate the grape vines beneath the pergola while they get established, so it needed to remain in its original function. I decided instead to utilize the extension I had previously installed on the piping system for the concrete planter station. Before we put down pavers or built the concrete planter, I installed a spur off of this line towards the avocado tree basin, with a valve that could shut the spur off. I installed it with the idea that it might be used to extend the irrigation system, and I am glad I did. Off of this spur I installed a 360 degree sprinkler head that will water the soil around the avocado tree basin, as well as a hose connection to attach the temporary sprinkler system to this station. The drip system in the concrete planter doesn’t take much flow at all, so both that and the sprinkler system could run at the same time. With this station, and the original hose connection station, I can get sprinkler coverage over almost all of the concrete pavers where the creeping thyme needs to germinate. The drip system in the concrete planter will have to run on the same three times a day schedule as the sprinklers, which is not ideal for these plants, but it is only temporary. It is not a perfect system, but it should be adequate. I also used some of the wood from an old fence to build a little shade structure for the dogs to lay beneath, near the avocado tree. I felt bad about trimming the jasmine plant where they used to lay in the shade, so I made them some more shade. Once the avocado tree is full grown there will be plenty of cool ground for them to lay on. Now for the final task in the implementation phase of this project, spreading the creeping thyme seeds. We mixed half of our 1/4 pound of creeping thyme seeds in with about 2 quarts of sand, and then used a sort of large salt shaker to spread this mix evenly throughout the concrete pavers area. These particular seeds need light to germinate, so we were able to just spread them on top of the ground without covering them with a layer of soil. We split the seed mix into 4 parts, and did one quarter of the yard at a time to ensure that we did not run out of mix before we completed the seeding. Once this was done, we made another seed/sand mix with the white clover seed and spread this around the avocado tree basin, throughout the herb and citrus planters on the side yard, and anywhere else there was exposed soil. White clover is a perennial nitrogen fixer and a ground cover, so I am hoping that it will get established in these areas instead of the grass and weeds that once covered the yard. With the seeding done, I made sure that the irrigation timer was set correctly, and we packed up most of our belongings into the car for the drive back to Orange County. We will be back to pick up the rest of my tools in a week, and check on the progress of the yard. Today we began the implementation phase of the project. I decided to start with the back yard, leaving the front yard and driveway open for storing materials like gravel and concrete blocks. My biggest challenge at this time is trying to figure out how every step and element in the process fits into space and time. What needs to be done first? What materials do I need now and where will I out them? I want to make sure that I don’t miss any important steps and be forced to go back and re-do work we have already done. A project of this scale is a bit overwhelming to look at all at once, so I decided to break it down in a web chart similar to the one we created before the design process. I wrote down every major element of the project, and surrounded it with the tasks and materials that would be needed to complete it. I could then see what was required for every different piece at once, and make connections where similar materials were needed for different elements. Using this web chart as a reference, I was able to write out a rough flow chart of the steps involved in implementing the back yard design. I am sure that I will be making slight changes to the order of tasks, but at least now I can see what needs to be done right now, and have a rough idea of what is next, when I will need materials, and what needs to be done before we can move forward. I was feeling somewhat stuck and overwhelmed at the beginning of this day, but now I feel a lot more confident about completing the project. 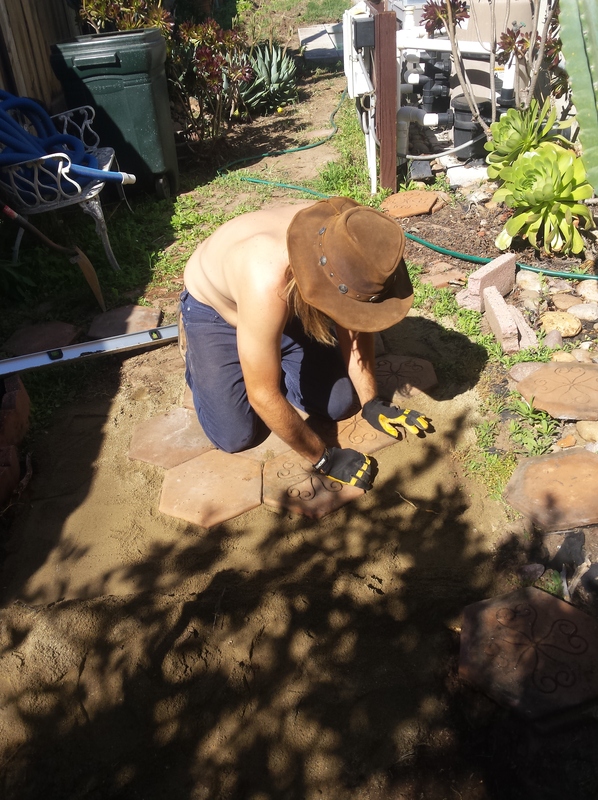 While I was working on the implementation plan, Carol-Anne got began the first task in the backyard, which is removing the decorative rock border around the pool. 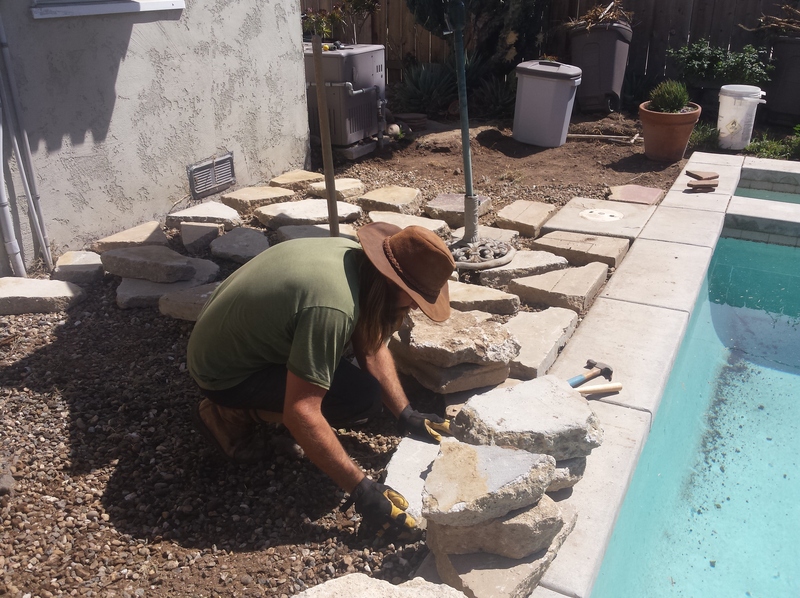 Today we continued the work of removing the rock border from around the pool. We moved the rocks to the front yard where they will likely be used in the green strip succulent garden as a decorative mulch. We also began to excavate the existing irrigation pipes around the back yard, as most of them will be removed and the new irrigation lines will need to be installed at a lower level, beneath the future swales/infiltration basins. I carefully excavated around the irrigation control valves and hose bib, so I could see where each valve led to. There are some water and gas lines leading to the garage that I began to uncover as well, so I could ensure that we do not damage them accidentally while digging the swales. When this was done we began to scrape out a level path on the side yard for the hexagonal tiles to be laid into for a new path. 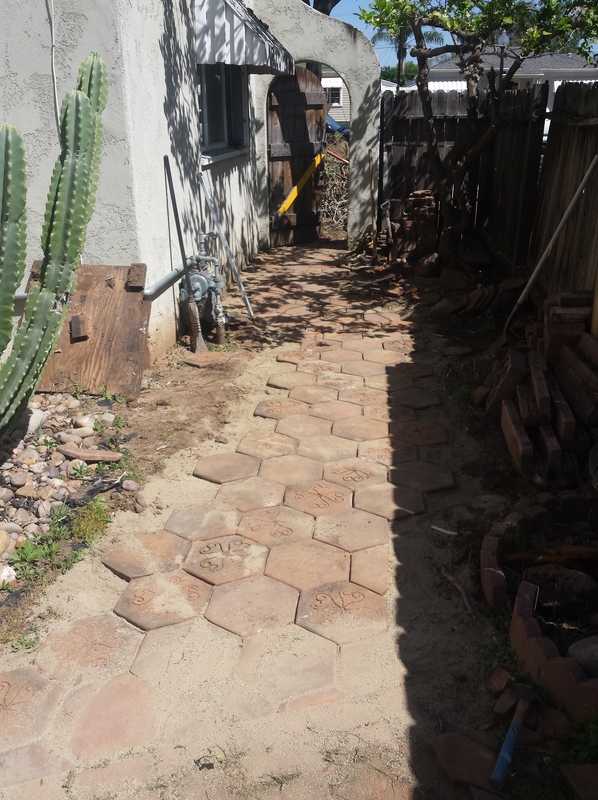 Today we began installing the hexagonal tile path along the side yard. This was a good project to get started on while we source materials and finalize our plan of action for the back yard. I purchased a 1/3 yard bag of sand from Home Depot the night before, which we used as a based for the tiles to sit on. The dirt path was leveled and then packed with a tamper, and then the sand was poured on, spread and leveled. The sand was packed with the tamper and then the tiles were placed on top. 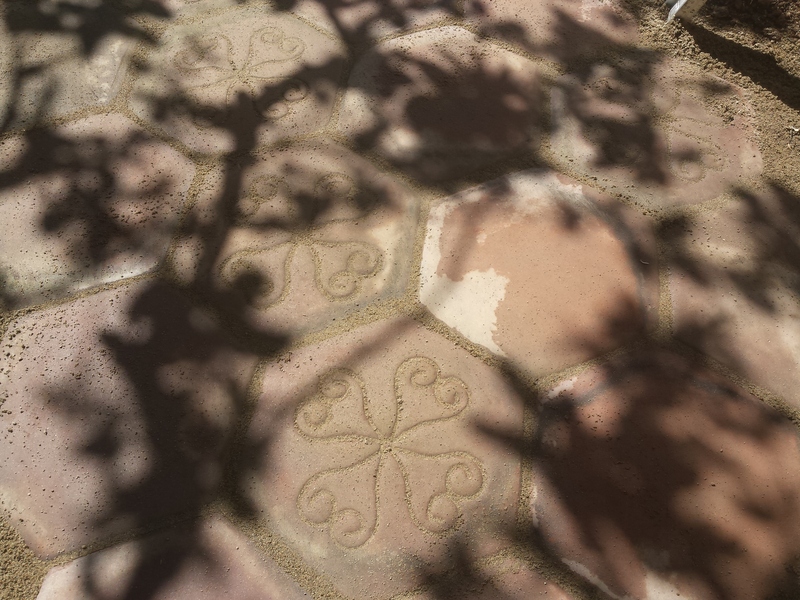 I found that it was very important that the tiles were settled evenly into the sand and well supported, as they are fragile and easily cracked if there are voids beneath them. Once all of the tiles were in place I used a push broom to spread sand into the cracks between the tiles. I then sprayed water over the path to help the sand settle into the cracks. These steps were repeated a few times until the cracks were well filled, leaving the path well settled and the tiles firmly supported. I am quite pleased with how the path turned out, the tiles make a beautiful pattern and the path makes the side yard much more inviting. Today was a lot of heavy work. We started by digging out more of the existing irrigation lines, as well as digging a trench for the future grey water irrigation line beneath the fire pit area. The dirt we are removing is being wheelbarrowed to the south west corner of the yard to be stored for now. Later, much of this dirt will be screened and combined with compost to fill in the growing beds and in between the concrete pavers. In the afternoon, we took the truck to pick up a load of broken up concrete blocks that were posted in the free section of Craigslist. It was a lot of work loading and unloading the concrete from the truck, but these pavers are free and are being recycled instead of ending up in a land fill. Buying new pavers would be easier, but there is a huge amount of energy used in manufacturing and transporting those pavers to the store, not to mention the price. We are expending a little of our personal energy to prevent a lot of wasteful energy eslewhere. Today we continued to dig out the existing sod and dirt in preparation for the concrete block pavers. We started next to the house on the east side of the pool, and will move around the pool from there. Again, this sod and dirt was moved to the south west corner of the yard. We constructed and used a “bunyip” water level to shape the dirt into the appropriate slope for drainage away from the house and towards the infiltration basin, using the level concrete slab around the pool as a reference point. We also dug a new trench for the irrigation line that will water the trees along the south fence. This was filled back in and the dirt packed down with a tamper. I called a local rock and gravel supplier and found out that the gravel we need to place below the concrete paving stones will be one of the biggest materials costs for this project, as we need quite a lot of it for the large area of pavers we are going to install. I again checked in the free section of the local Craigslist and found a few people giving away gravel from their yards. We drove out to one of these houses to get some free gravel, but unfortunately found that much of it had already been removed from the yard, and what was left required laborious scraping and shoveling. It was almost not worth the time and gas spent to get there, but thankfully there was a section of gravel in the back yard that had not been removed yet, and we quickly made up for the time spent scraping in the front yard. We got home and laid down a few concrete blocks as a test. It certainly looks like we have a lot of work ahead of us. Today we had our first experience laying down the concrete pavers, which will eventually take up most of the space in the yard. We started at the top split of the “watersheds” in the design that will direct rain water into the different infiltration basins. This split is located at the south west corner of the house and will direct water either towards the south side of the pool, or along the back of the house and towards the north side of the pool. I found that laying out the concrete slabs is a time consuming process, especially in this area where the slope and elevation of each slab is critical to direct the water flow. This is also the widest area needing to be filled with pavers, so it takes a lot of them to fill the space. I am hoping this process will go faster in the skinnier sections around the pool. 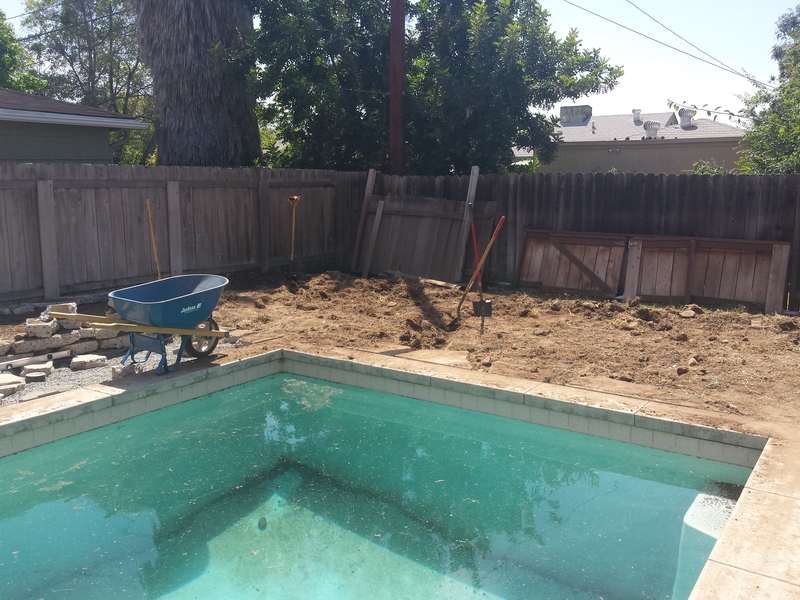 We also continued to dig and level out the dirt moving away from the house and towards the north side of the pool. We used the water level quite a bit as i wanted to make sure the water from the outdoor shower I plan to install will flow towards the vines that will grow over the pergola. This shower, if used frequently, should provide al the water these vines need. An outdoor shower was a much simpler method of delivering household grey water to the back yard than re-piping the house showers. 970 ft.sq. X 1 in. X 0.623 = 604.31 gal. These calculations make it seem like an awful lot of water is being lost and not much is being stored. However, these calculations assume an impermeable surface such as a roof. Much of the catchment for this basin is made of the concrete slabs set on gravel, with soil in between. This surface will absorb a large amount of rainfall before it becomes saturated and water starts to flow over its surface towards the basin. The actual impermeable surface catchment leading to this basin is 648 square feet, meaning about 400 gallons will be directed to the basin per inch of rain. Also to consider is the fact that the average rain event in San Diego drops about 1/2 an inch of rain over a 24 hour period. So that leaves about 200 gallons being collected each storm, still farm more than the 24 gallons the basin can hold. However, 24 gallons is the amount of water the basin can collect on its surface. The 5 inches of soil and gravel between the concrete slabs will have to become completely saturated before any water will collect on the surface, and this is the real purpose of the basins, to store water in the soil between and beneath the concrete slabs. With the slow gentle rains that normally happen in southern California, I predict that the infiltration basins will rarely fill up. Of course, for those times when the rain does fall quick and heavy, the record being 3.24 inches in 24 hours, there will be the overflow drain leading to the last infiltration basin in the south west corner of the yard. This basin will be much deeper and have a much larger capacity. 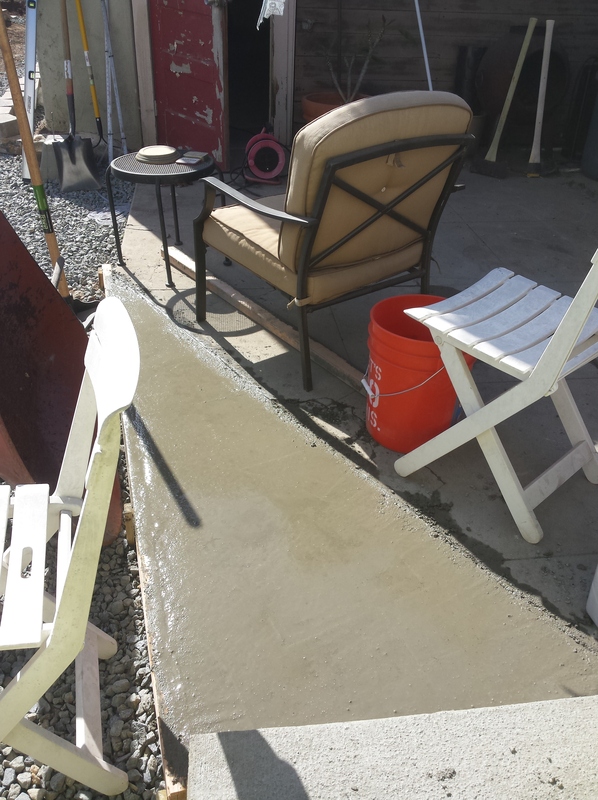 Today I poured a new concrete step in front of the back door. As it was, you had to exit the house and turn right to step down onto the patio. Most of the time people would just continue forward out of the door and step down the large drop from the landing instead of using the step to the right. This is of course a bit dangerous, and Melissa said she has twisted her ankle before stepping down from the landing this way. I built a form out of some old fence boards and continued the step on the right around the front of the landing. This should make exiting the house much easier. While the concrete was setting, I prepared set in place the pier blocks that the pergola posts will rest on. These needed to go in before the concrete pavers, as they needed to sit on the compacted sub-soil and will be surrounded by the concrete. I will be leaving soil filled spaces near the pier blocks so that vines can be planted to grow up the posts. We also ran into a small problem while digging out the infiltration basin next to the pool. There was a large chunk of concrete underground that had spilled out from the pool coping form when the pool concrete was poured. I had to break this up with a sledge hammer to make room for the concrete pavers. Today I decided to pour another concrete slab extending the patio out to the edge of the new stair. I felt like this would be much safer than having to step down onto an irregular concrete paver, and all the edges around it. I built another simple form and poured in the concrete. After I had smoothed out the concrete, of course, Max the dog walked right through it, so i had to do it over again and make a barrier around the slab with chairs and other objects. 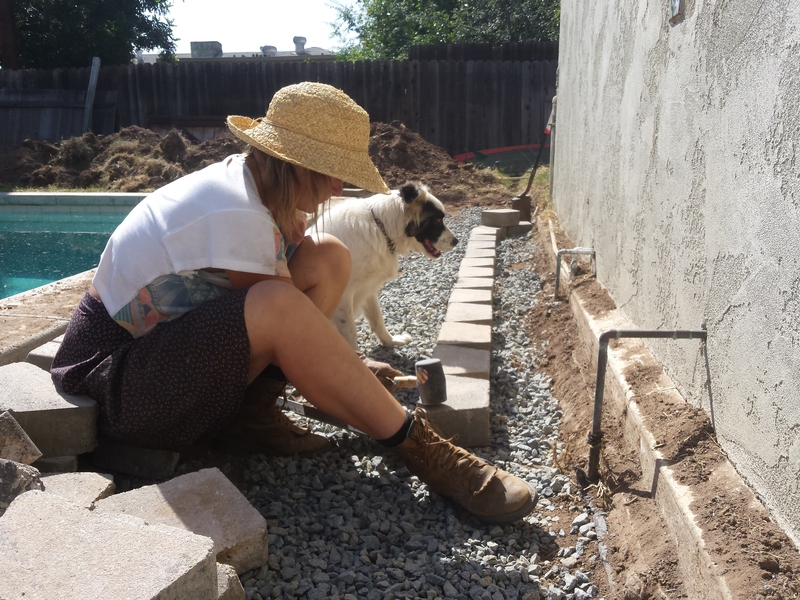 While I was making the new slab, Carol-Anne built a low retaining wall out of purchased concrete blocks, that forms the growing bed along the south wall of the garage. I decided to use purchased blocks instead of urbanite for this wall because the space between the pool and garage is already quite limited, and the blocks would allow for a thinner wall. A few days ago I responded to an add in the free section of Craigslist for concrete chunks that would be delivered. 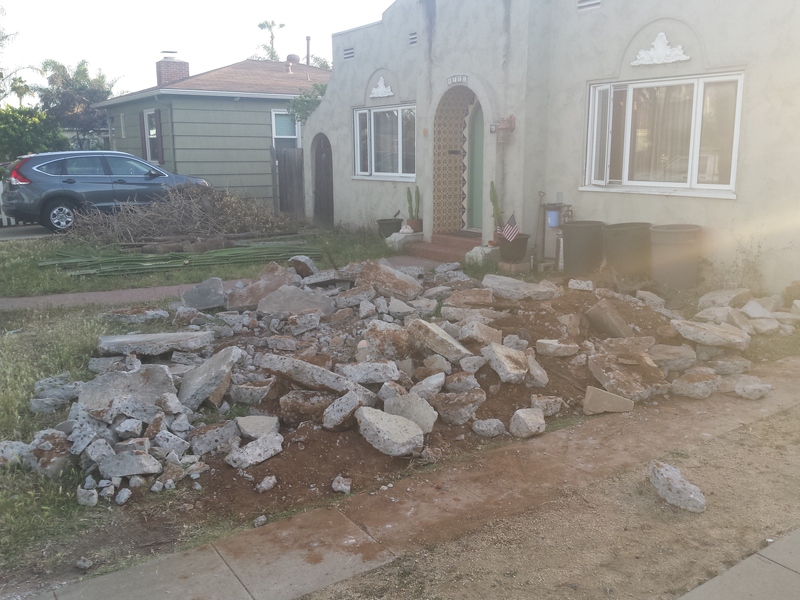 Today the contractor showed up with a 2.5 yard dump trailer filled with concrete and dumped it in the front yard. He offered to bring another load, and considering the amount of space we need to fill with urbanite pavers, I accepted and he came back a second time. There is now a huge pile of concrete chunks in the front yard, most of which I estimate we will be using in the back yard. We may have to load whatever is left over in to the truck and bring it to a recycling center when we are done, but having this concrete delivered saved us from having to load the truck with concrete 6 or 7 times, and all the time that would require. Thank God for Craigslist! We also took a drive up to Mountain Meadow Mushrooms in Escondido this afternoon and picked up a truck full of spent mushroom compost. This mushroom growing operation has a huge pile of spent growing medium in their yard that is free for the taking, you just have to shovel it yourself. I plan to mix this compost with the existing soil to fill in between the pavers and inside the growing beds. I will be using whatever is left after completing the back yard to sheet mulch the front yard. This compost is full of mycelium, so I am hoping that it will help shift the soil biology towards more balance between bacteria and fungi, which will support bushes, shrubs, and trees instead of just weeds. Today we filled in the first of the concrete pavers with soil. 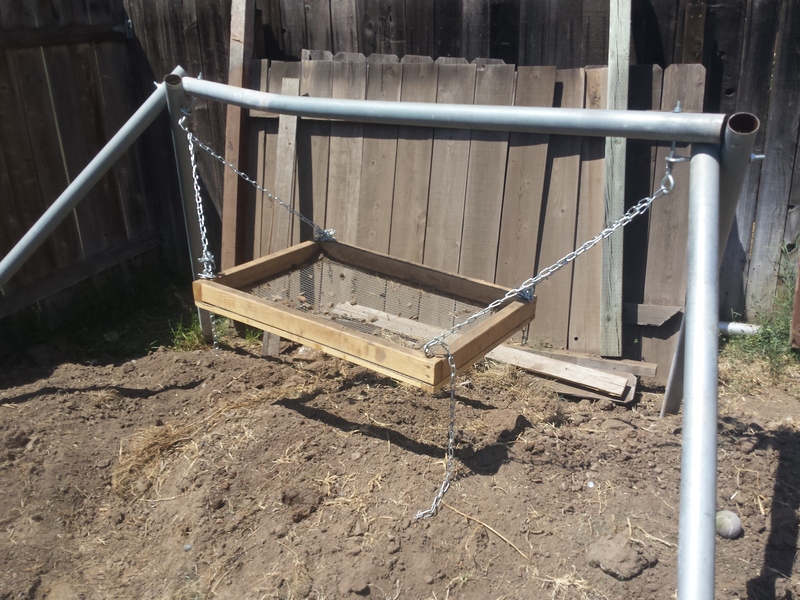 I built a compost and soil screen out of wood and 1/2 inch hardware mesh, and built a stand to suspend it from by utilizing some metal fence posts that were in the back of the yard. I connected the poles with 6 inch eyelet bolts and suspended the screen from chains so that it would hang just above the level of the wheelbarrow. This allowed us to screen the grass and rocks out of the existing soil, while mixing in some of the mushroom compost to add fertility and soil biology. Since we have such a large amount of native soil beginning to pile up in the back of the yard, I decided to mix 3 parts soil to 1 part compost in order to use more of the native soil in between the pavers. We sifted a few wheelbarrow loads of this soil/compost mix and raked it into the cracks between the concrete pavers. I soaked this thoroughly with the hose to help the soil settle into place. I want to make sure that the soil level between the pavers doesn’t fall over time, leaving trip hazards all over the yard. We will see how this mix works. After a couple days off we are back at the back yard project. 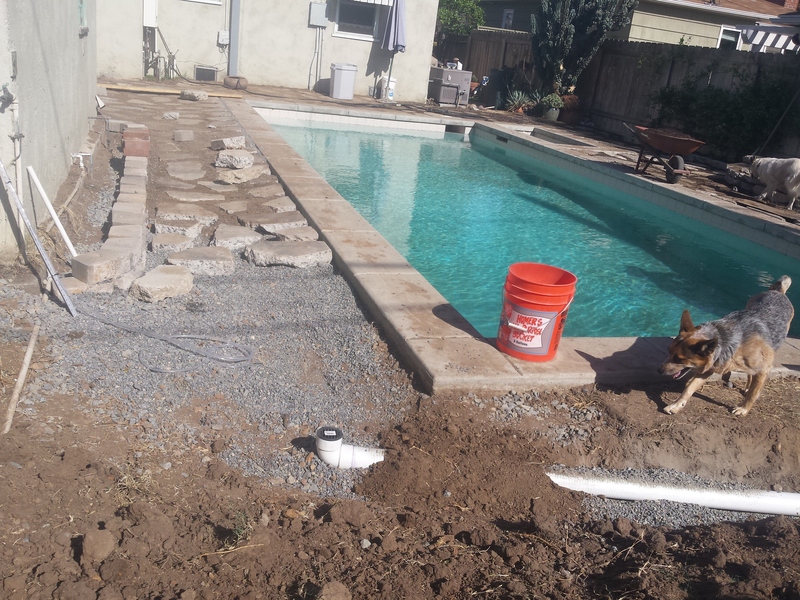 We laid in some more concrete pavers along the north side of the pool and in front of the patio. The first yard of gravel I purchased to spread beneath the pavers was 3/4 inch crushed rock. For this next section I purchased 3/8 inch crushed rock and found that it makes setting and leveling the pavers much easier. However, placing the concrete slabs is still quite a laborious task, and it seems that I will be doing this for longer than I expected. While I was doing this, Carol-Anne continued to dig up the sod and soil from the south side of the pool. We also prepared a few more loads of soil/compost mix to fill in the cracks between the pavers that have been laid. I found that the mix we used for the first section was very soft and took a few repetitions of soaking and drying out to settle into the cracks between the pavers. I decided for this next section to add in some of the 3/8 inch gravel to make a more solid mix. We used 2 parts soil to 1 part gravel and 1 part compost in this mix. We will see how it does. Today we finished digging and leveling the infiltration basin on the south side of the pool. We again moved the dirt to the southwest corner of the yard, which is now gather quite a large pile of soil. I am hoping we will be able to put a lot of this soil back into the cracks between the pavers, and move the rest to the front yard to create topographic texture. After the leveling was finished I dug a new trench for the irrigation system and laid in the PVC pipes, as well as setting in a couple valve boxes at the level of the finished infiltration basin pavers. Although PVC is not the most environmentally friendly product, HDPE is a much “cleaner” plastic for irrigation lines, I am electing to use PVC for this project because I already have so much of it on hand from pulling out the old irrigation system. Nearly all of it is still in good shape and will be able to be recycled back into the project. We also began building the planter on the south side of the pool, laying the foundation with large slabs of concrete. Heavy work! We spent the whole day today finishing construction on the urbanite planter. It is basically made up of a wall, 3 slabs high that encloses an area to hold soil. Even though we only did a wall three slabs high, it took all day to finish the planter. It was like a big, very heavy, jigsaw puzzle. Each piece has to fit neatly with the blocks around it, so a lot of time was spent moving slabs around, trying to find the right piece for a particular spot. Then, rocks and gravel were used to fill gaps beneath the slabs to ensure that they lay flat and don’t rock back and forth. Needless to say, we are very, very tired after this day of work, but the planter is finished. More pavers! The pile of concrete in the front yard is getting smaller and smaller, especially after all the slabs we used in the planter. It looks like we may actually run out of pieces that are big enough, a big surprise after seeing the size of the pile when it was dropped off. I am starting to get pretty tired of working with urbanite, physically and mentally, but the job has to be finished. I keep trying to think of a different option for a long term, low maintenance surface for around the pool, but the urbanite pavers still seem like the best option, even though they are a lot of work to install. For some easy work at the end of the day, we began filling in the planter with soil from the pile in the back corner of the yard. We filled the bottom half with the native soil, and we will fill the top half with a 1 to 1 mix of compost and soil. A good friend of mine recently presented me with the opportunity to redesign her suburban home’s landscape using permaculture design. I am, of course, very excited about this project and would love to share the process via this project journal. 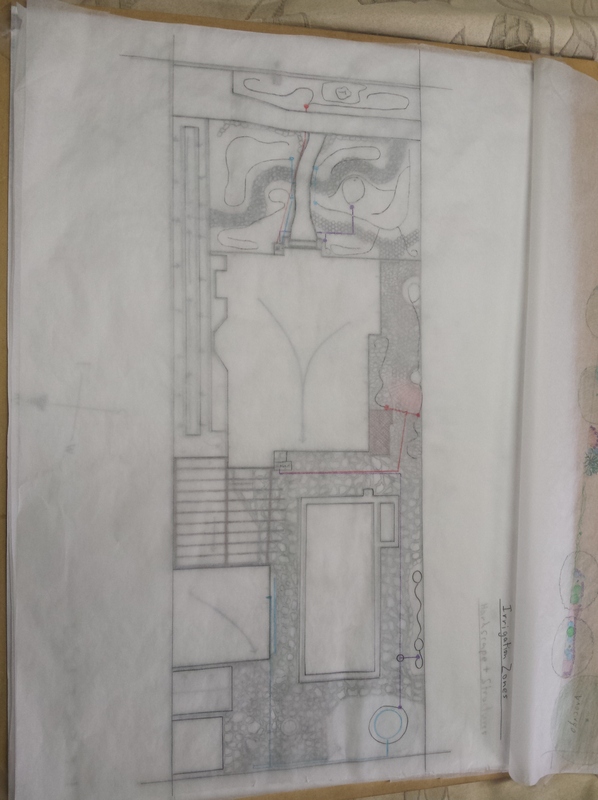 I will be using this journal to document this yard conversion from start to finish, as well as to give my readers a chance to see what goes into creating and implementing a permaculture design on a suburban lot scale. 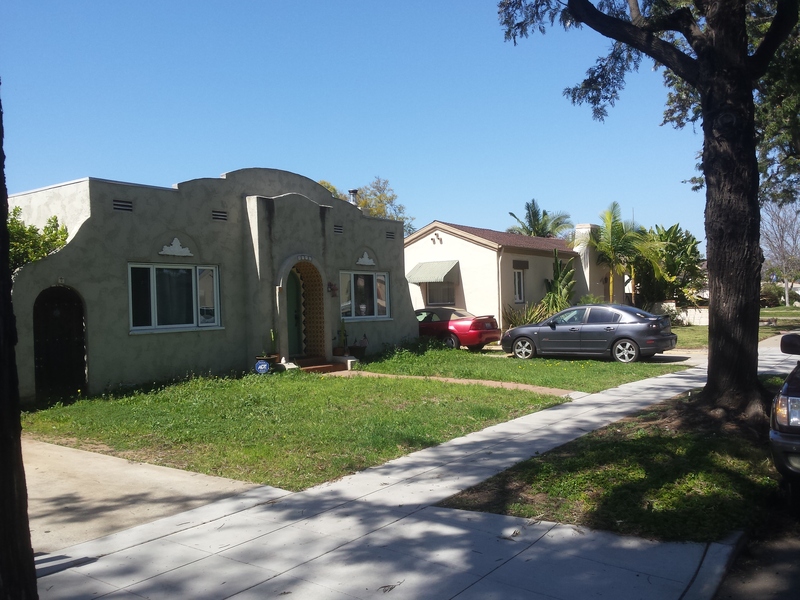 This suburban home is located in San Diego, California, near San Diego State University. The home was built in 1927, and has been owned by my friend, Melissa, for the last 15 years. At the start of this project she expressed her primary motivations for doing the yard conversion: The current yard is a former lawn which has been destroyed by her five (yes five) dogs and is now covered in weeds. The lawn/weeds requires too much water to keep green in the summer time, especially with water rates rising recently, so she would like to replace it with a low water usage/drought tolerant landscape that is easy to maintain and can withstand abuse from her dogs. She likes the idea of having fruit trees and edibles in the landscape, but is not interested in intensive gardening. She would also love to have a nice comfortable space to entertain in what is now a very hot back yard. With these motivations as a guide, I am hoping to design and install a landscape that is pleasing to the senses, harvests much of its own water requiring little extra irrigation, is very easy to maintain, and will provide some food crops well into the future. Today I met with the client, Melissa, for the initial client interview and walk through of the site. The site is a suburban home and lot in San Diego, California which she owns but has recently moved out of, leaving her two sons and a male tenant to occupy. I had previously sent a client questionnaire which was filled out by Melissa to gauge her initial interest and intentions. Today we built upon that questionnaire and got some more detailed information regarding the site and the goals for the project. We also answered some key questions about the ethics guiding the project, the roles of the people involved, how the design and implementation process will progress, the budget, the expected time frame, and the end point of involvement for me and my team. This information will go into a memorandum of understanding which will be signed by all parties and help to reduce or eliminate any misunderstandings, and create clear expectations. These questions, many of the client interview questions, and the whole design process over all is being guided by the book Permaculture Design: A Step-by-Step Guide by Aranya, which I have found to be a very practical and easy to use reference book to have on hand during the entire design and implementation process. This was a very effective way to help us see the individual tasks that needed to be accomplished so that we could then create a to-do list, and start to decide what needs to be done first. We also talked about what out individual roles would be, and who’s skills would naturally be fitted to each task. We stepped away from this meeting with a much better idea of what we need to do to get started, and how we can move the project forward. Today was the first real work day, in which we started to clear away some of the existing over-grown plant material on site. This was done to allow easier access to the site for mapping, and provide a more clear view of the base point from which we are starting. Carol-Anne cleared away all of the weeds in the back yard, mostly common mallow, while I pruned the existing lemon tree. There was quite a lot of pruning to be done as the lemon tree has not been pruned in at least the last 15 years in which Melissa has owned this home. The interior of the tree was tangled with suckers and not much light was penetrating. Now that the tree is pruned that corner of the yard is receiving much more light, so this new pattern may be considered during the design process. Today we created a base map of the property, consisting of the boundaries and major elements currently existing on the project. To start out we used a 100 foot tape measure to record the size and relative location of each building, the pool, and the hardscape areas. This was accomplished using the base line method described in the permaculture design handbook mentioned earlier. Each important point, like a corner of the pool, was measured from two separate points on a fixed baseline, such as the front curb or the south side fence. These measurements are used to triangulate the position of each important point. 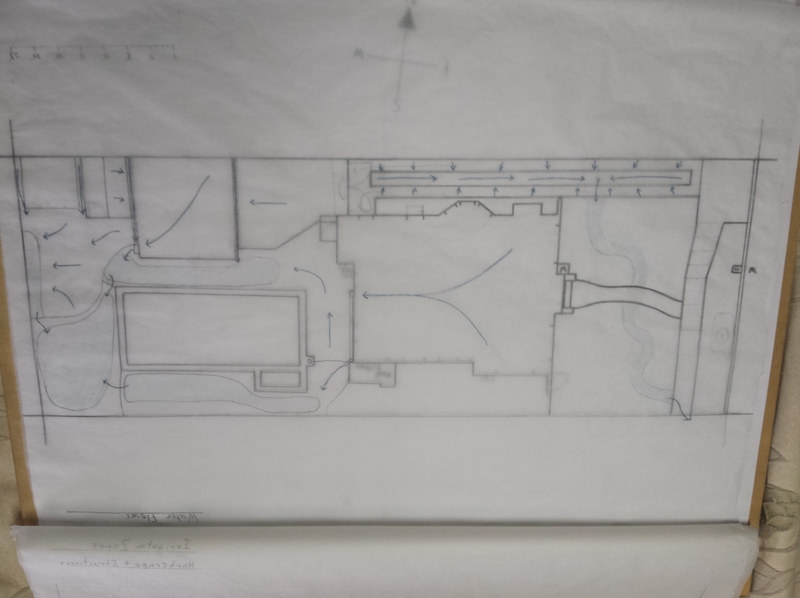 All of the measurements were written down on a rough sketch in the field, and then used to create a scale map on a drafting board. Meanwhile, Carol-Anne created an inventory of the materials already available on site, and did some research to identify the existing plants as well as other plants and fruit trees that might be suited to the site. Today I turned on the existing irrigation system to map out which zones were controlled by each valve. There is a system of valves in the backyard near the hose bib and water heater, as well as a system of valves in the front near the hose bib and water filter. In the back yard, I was unable to locate the sprinklers for the first valve, although I could hear water running. This likely means there is a break in the line somewhere underground, but I could not see wet ground anywhere. The other zones were easy to locate, as each valve controls the sprinklers along a different edge of the pool. By elimination, I believe the first valve is supposed to control sprinklers along the south side of the house. In the front yard I found that 2 out of 3 irrigation zones are broken underground, so I can not identify where they go. The existing sprinklers are arranged around the edge of the lawn and are the spray type. It is quite likely that I will be removing most of the existing irrigation system, front and back yard, and replacing it with a simple drip system to help with establishment of the new plants. Once the landscape is established and well rooted, I am hoping that the water harvesting features of the design with prevent the need for further irrigation. Much of today was spent drafting and creating layer maps for the design. I started out by creating a sun sector map, showing the minimum and maximum extent of the sun rise and set points through the solstices. The lot is positioned almost directly along an east west axis, so the yard receives much sunlight throughout the entire year. The only shadowed area is along the driveway on the north side of the house, but this area is already well planted and we will likely just be filling in with some nasturtium seeds. I then created a map of the projected water flows through the site. The entire roof of the house drains at one point along the west wall into the back yard, which makes water harvesting very simple. It is interesting to note that this house was built in 1927, while most of the other houses in this neighborhood were built in the 50s and 60s. All of the surrounding houses have roofs that slope outwards, shedding water off the side, while this house has a roof that collects water at the center. It seems that in 1927 the designers of this house still realized that San Diego is in a desert environment and that water is a resource that should be collected. By the 1950s builders and designers had started to ignore this reality and build houses that repelled water. In my design I plan to utilize the water hat is collected and concentrated by the roof, by directing it into level infiltration basins where it can soak into the ground and be stored for the use of the plants in the landscape. I separated the back yard into different “watersheds” or zones, one on either side of the pool and a third in the back of the yard. The water from the house roof will drain into the south side of the pool, while the water from the garage and shed roofs will drain into the north side of the pool. Both of these basins will overflow into the third basin at the back of the yard. In the event that this third basin fills completely, it will overflow out of the back of the property and into the easement, where the water is currently leaving the property via an existing French drain. It would take a very large rain event for all three basins to fill and overflow, but an event like this must be accounted and designed for. While I was drafting, Carol-Anne was pruning more of the existing plants and succulents, including a large amount of woody material from a tree that was growing up between the sheds and the north fence and covering much of the shed and garage roofs. It appears this tree was cut down when the shed was installed but has grown back from the stump, so it will likely need to be cut back yearly to prevent it from damaging the sheds. There was a lot of leafy material that had collected on the garage and shed roof from this tree that will be useful as composting material. Today I did a bit more drafting and design work, mainly creating a map of the hardscape and structures that will be installed. 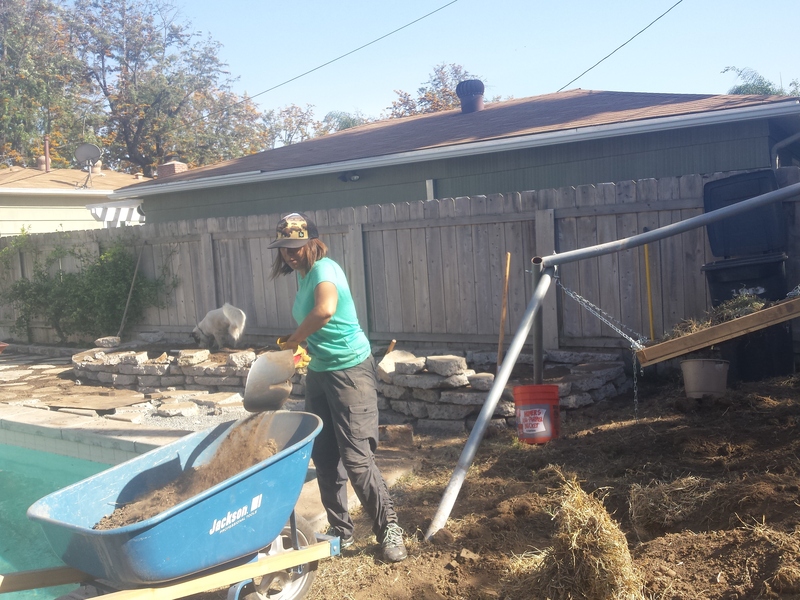 Most of the back yard will be covered with a semi-hardscape made of broken up concrete chunks, aka “urbanite,” with approximately 6 inch gaps between the blocks where a groundcover will be grown. This will provide an easy to maintain surface that will prevent the dogs from digging, while also allowing water to soak through. A layer of gravel will be laid down beneath the urbanite to prevent them from sinking and allow them to be leveled, while the gaps between the concrete will be filled with a mixture of compost and the existing soil to provide a well drained growing medium for the ground cover. The layer of gravel will also provide a zone for water to collect without pooling above ground, it can then soak into the hard clay sub-soil of the site. 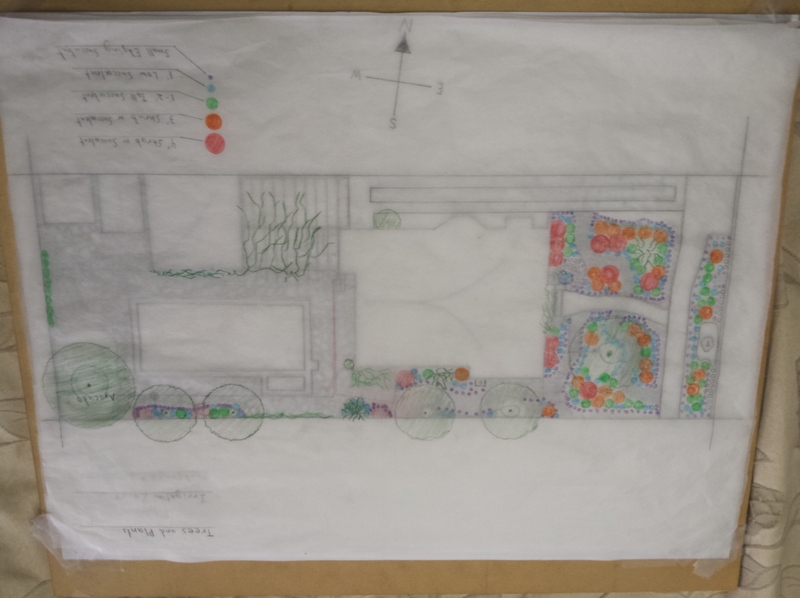 The hardscaped area will surround the pool, providing and easy walking path to the back of the yard, while two raised beds will be built along the edges of these paths. The plants and trees in these beds will benefit from the water collected in the paths. In the north west corner of the yard, in front of the sheds will be a slightly raise area that will serve as an additional rain water harvesting surface as well as a fire pit and entertainment area. This will utilize the same urbanite block hardscape, but the gaps will be filled with compacted decomposed granite to allow the water to run across the surface and into an infiltration basin and planter along the west fence. I will be building a large wooden “pergola” over the back patio to provide shade to this often too hot area. It will be grown over with vines that will provide great shade in the summertime, as well as food and a beautiful environment. I also created a map of the new irrigation systems. They will be quite simple, consisting of short runs of underground pvc piping leading to irrigation boxes in the planters, which will connect to drip lines. I am attempting to keep materials costs as low as possible, so the irrigation system reflects this. The irrigation is primarily meant to help get the landscape established, and hopefully wont be used much in the long term. 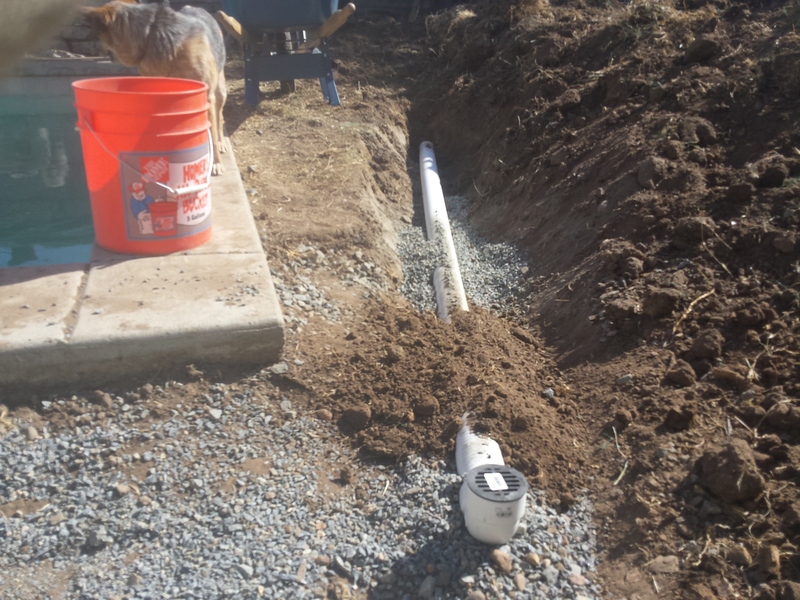 I am installing a grey water system connected to the laundry washing machine that will provide long term irrigation to the plants and trees that need it. Grey water is a huge source of water that is currently being wasted in most households. 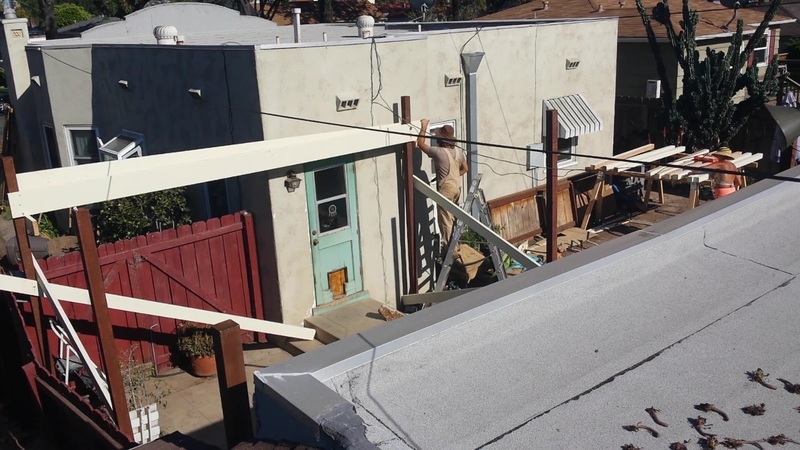 In California, a simple laundry grey water system can be built without a permit. I looked into the crawlspace beneath the house and saw that it would be possible to collect grey water from the showers and sinks in the house. However, at this time in California a permit is required to install this type of grey water system. A plumbing contractor would have to be hired to re-pipe the drains under the house, and pull the proper permits from the city, along with the accompanying inspection process. 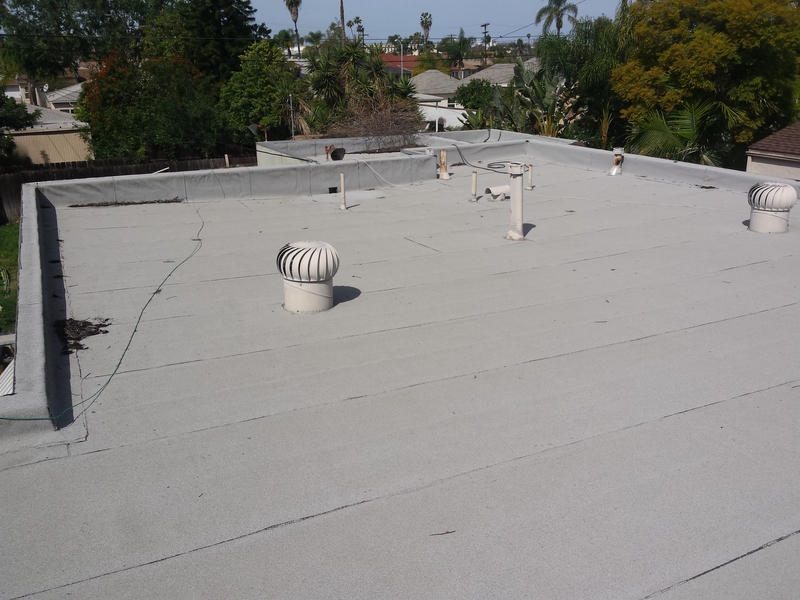 These factors put a household grey water system out of the existing budget for this project. One possibility for harvesting the grey water from showers is to simply build a new shower outside that drains into the landscape. This would not require a permit, or a complicated grey water delivery system. I will be discussing this option with the client at the first design proposal. Today I finished up the drafting and design work. I started by creating a plants and trees layer map over the hardscape map from yesterday. In the back yard, the main plant features will be an avocado tree in the southwest corner, along with two trees in the planter along the south fence. The avocado tree will be watered via the laundry grey water system, and will provide shade for the dogs to rest in as well as a great source of food for decades to come. The two trees along the fence will provide shade over the pool, preventing excess evaporation. They may also be fruit trees, but must be relatively drought tolerant. In the planter beneath these trees we will be planting native flowering shrubs and bushes, as well as small succulents around the borders to provide a nice looking edge. On the side yard to the south of the house we will be planting another fruit tree beside the existing lemon. Beneath these trees will be planted small “guilds” of plants that will help provide nutrients to the fruit trees. The rest of the area which is currently occupied by large Pitaya cacti and other succulents will be filled in with more drought tolerant succulents and the existing rock mulch will be extended. A meandering path will be created down the center of this area using the hexagonal tiles already on site. The front yard presented some design challenges, mostly because there appeared to be no source of rain water for catchment as the entire house roof drains into the back yard. I was almost settled on simply irrigating the landscape, but then I realized that the driveway could be altered to provide at least some water catchment during rain events. We will slightly dig out the strip of decomposed granite in the center of the driveway so that it drains to one point near the northeast corner of the house. The drain will go under the concrete strip and into a “dry creek” infiltration basin that will snake across the front yard. The existing expansion cracks in the driveway will be cut so that they angle towards the center strip, allowing water falling on the driveway to drain into the center, and then into the dry creek. This catchment may not be as efficient as a roof surface, but it will at least provide some water to the front, instead of allowing that water to soak into the center strip where it wont be useful, or drain off the front of the driveway and into the street. The dry creek will be lined with stones and provided a nice visual element to design the landscape around. The centerpiece of the front yard will be a 15 to 20 foot tall drought tolerant fruit tree that will be planted on the south section of the yard. 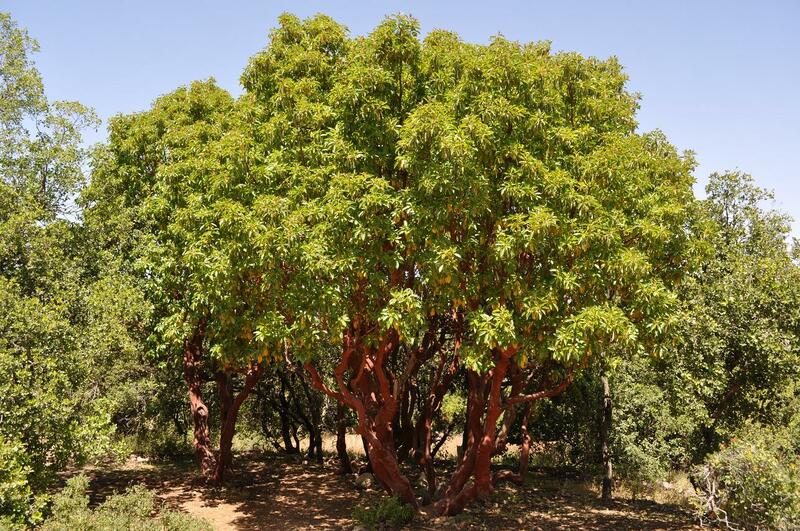 We are looking at the Arbutus unedo or “Strawberry Tree” as a good option for this feature, as it is relatively drought tolerant, quite beautiful, and provides an abundant yield of fruit. On the north side of the yard we will re-plant some of the taller Pitaya cactus columns that we cut from the back yard. We will plant a few of these columns together to produce the look of a mature Pitaya cactus. These cacti also provide a yield of beautiful night blooming flowers as well as fruit. Around these two main features will be planted a mixture of drought tolerant native flowering bushes, transplanted bunch grasses from the driveway, and succulents of varying sizes. We will be creating the look of a textured landscape by choosing plants with a variety of mature sizes, and arranging them accordingly. We will also be paying attention to the blooming times of the various plants to ensure that there is always some color in the landscape, as well as a year round supply of pollen and nectar for bees, butterflies, and other native pollinators. The “green strip” between the sidewalk and street curb will be filled in with drought tolerant succulents and a rock mulch to provide a beautiful and very low maintenance landscape. The entire front yard landscape, once established, should be very water efficient as well as low maintenance, requiring only annual pruning to prevent the bushes from becoming over grown. Today was the first or “rough draft” design proposal. 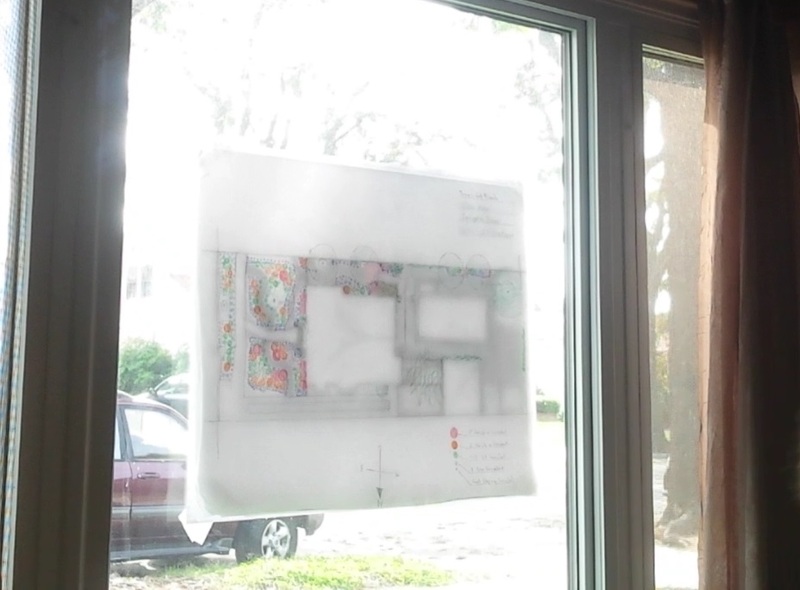 I used a window in the living room as a light box, taping the layered design drawings onto the window so they could all be easily seen together. I explained the features of the design to the client, Melissa, going over the water catchment features, the hardscape and structures, and the arrangement of the plants. She was very pleased with the design and is excited about having a beautiful new yard. We talked about the possible plants that could be used in the design, and I was happy to hear that she would like to use fruit trees wherever possible. We also talked about the outdoor shower and decided it would be a good addition to the design. Thankfully, there won’t need to be any major changes to the overall design, so we can now move o to the implementation process. I will now be moving from patterns into details, deciding which plants will be used and making lists of materials that will need to be gathered or purchased. From these lists, I will be able to produce a more accurate estimate of costs for the project, which at this point I am still projecting to be well within our budget, as most of the materials will be recycled from waste streams and therefore free.